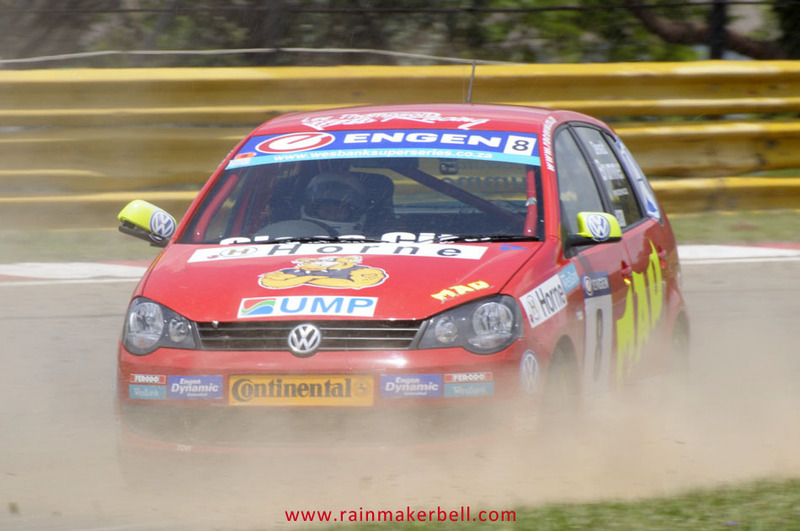 It feels like we’ve embarked on this wonderful motorsport photography experience only yesterday. 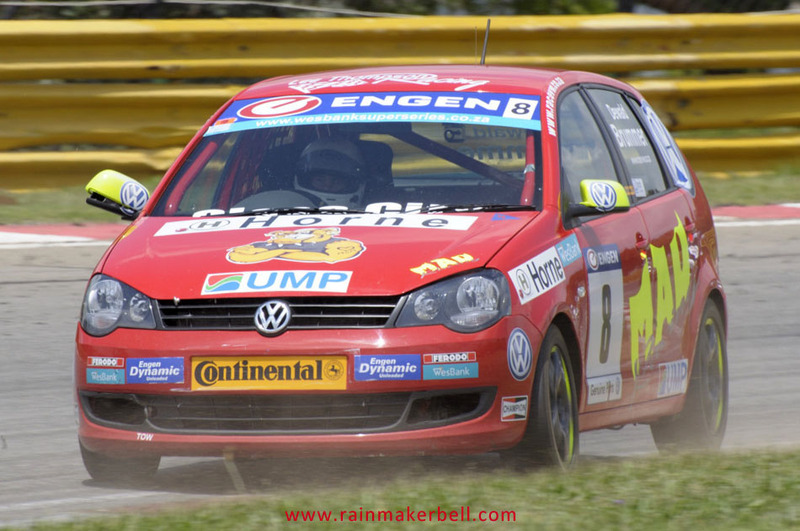 During the 2012 season we stood witness to so many joyous, but also not so joyous moments. 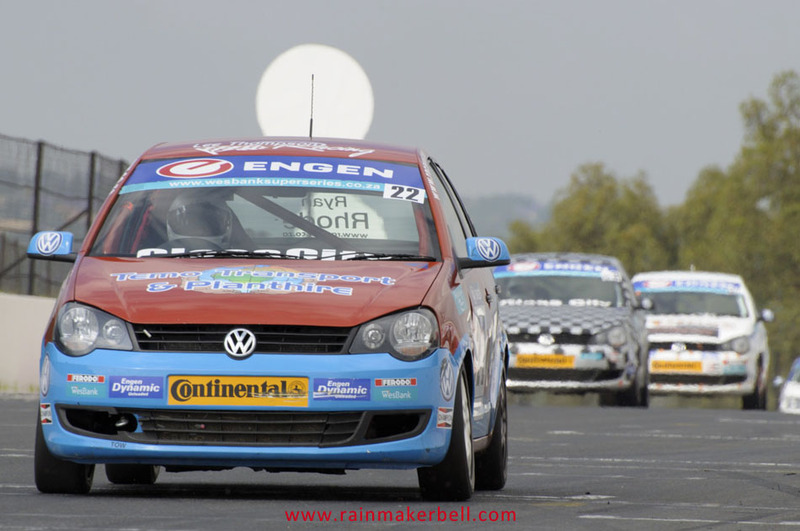 There were days in the harsh South African sun when we’ve longed for the mild English summers. 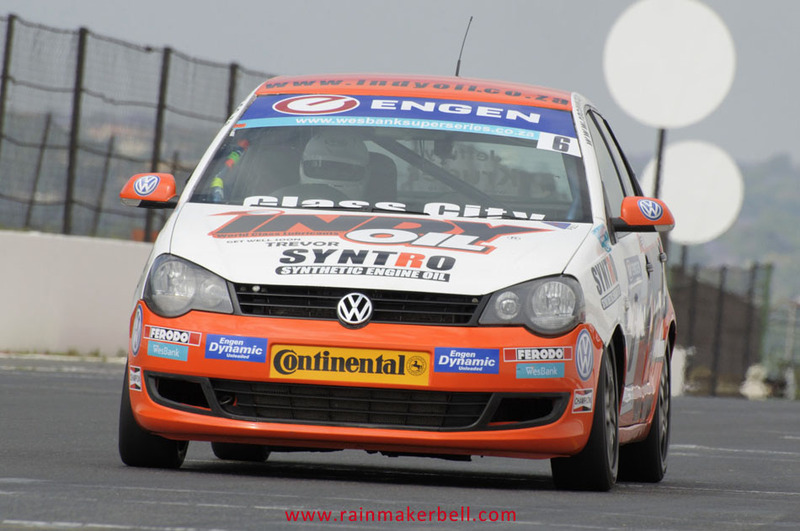 Then there were the cold, dark, rainy days we’ve spent on the grandstands, drenched, trying to capture the essence of the race day without freezing to death, but every ounce of energy spent next to the racetrack was worthwhile. 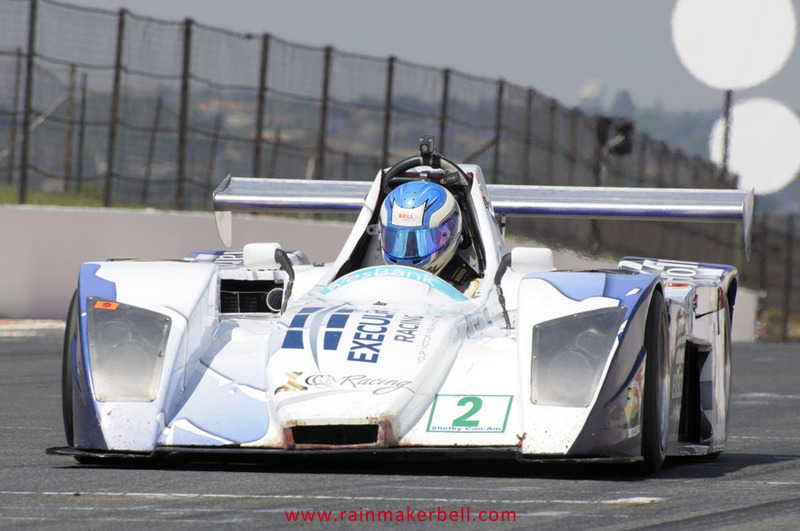 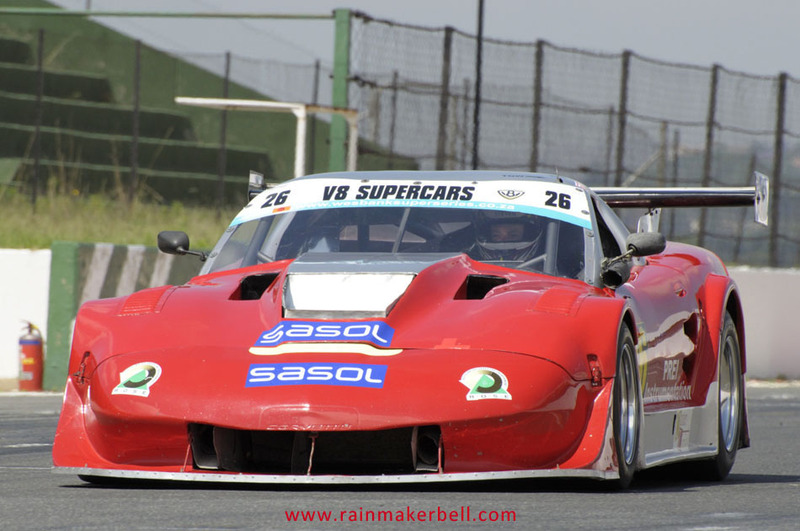 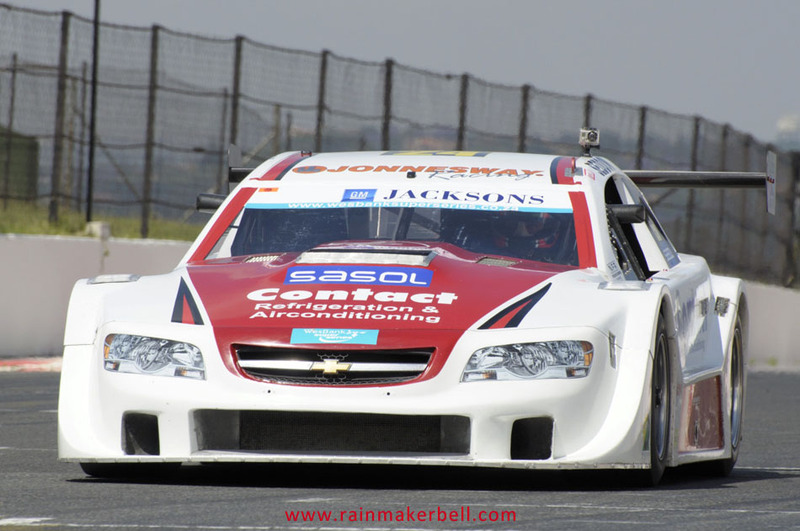 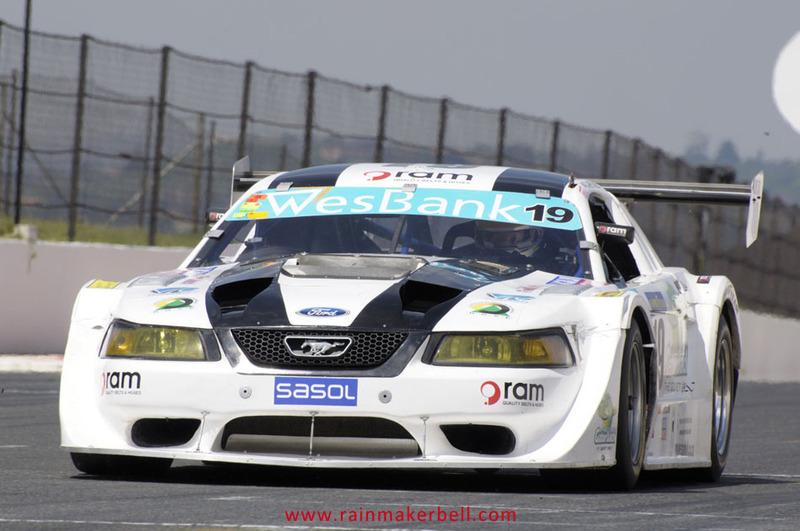 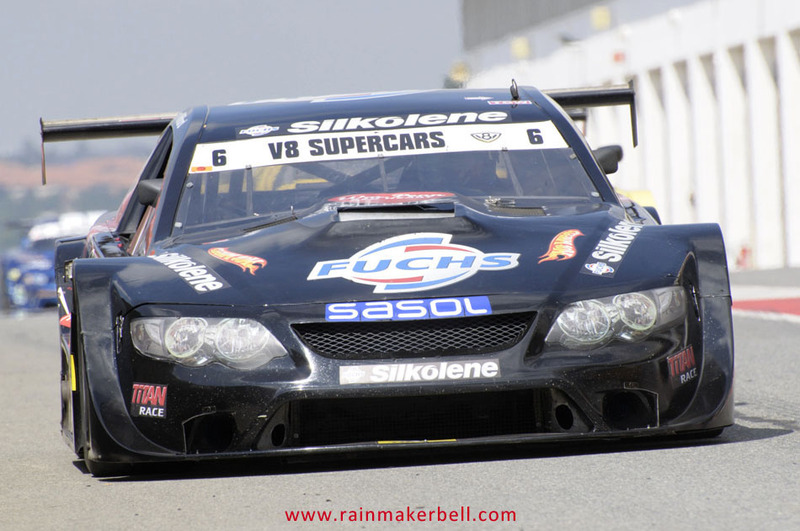 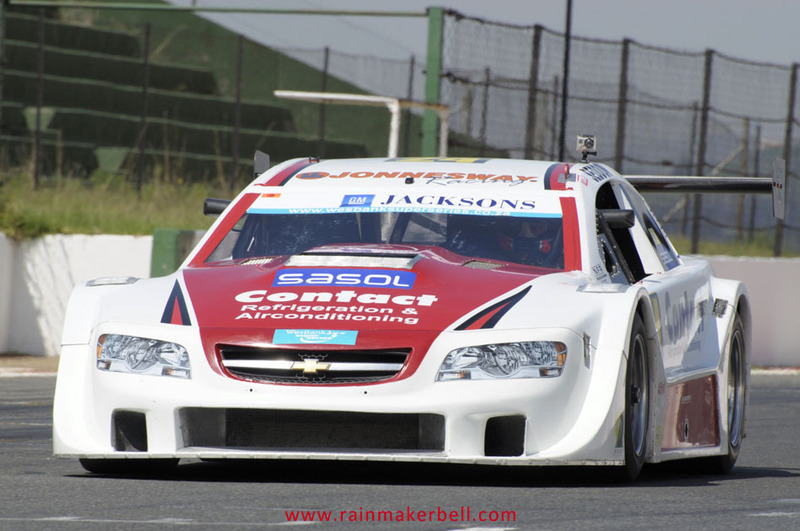 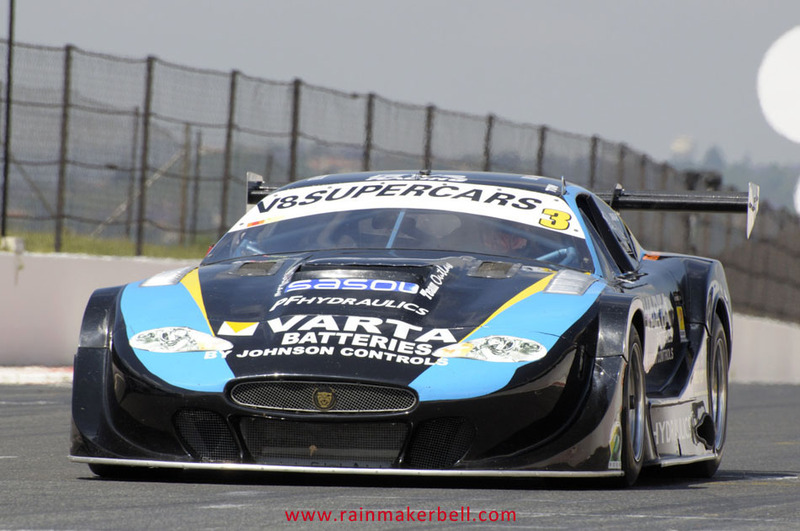 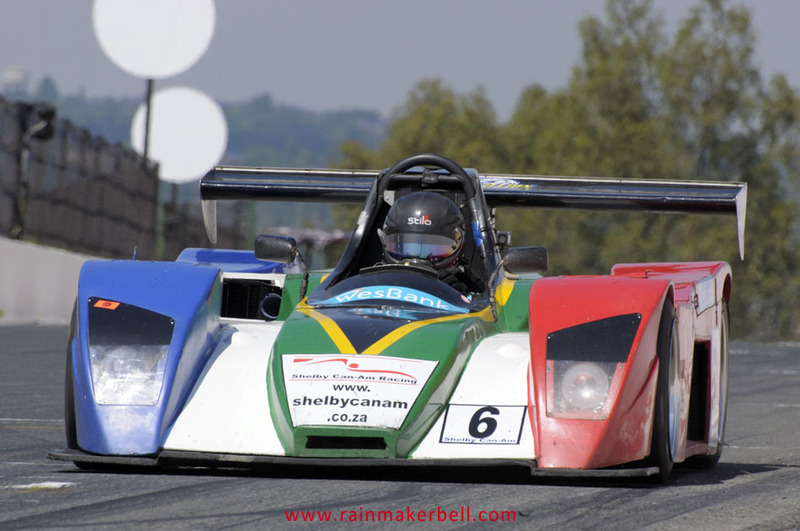 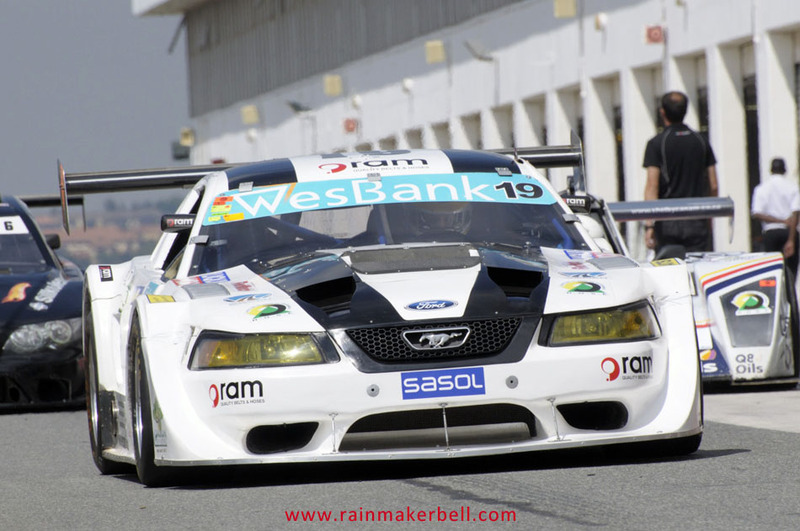 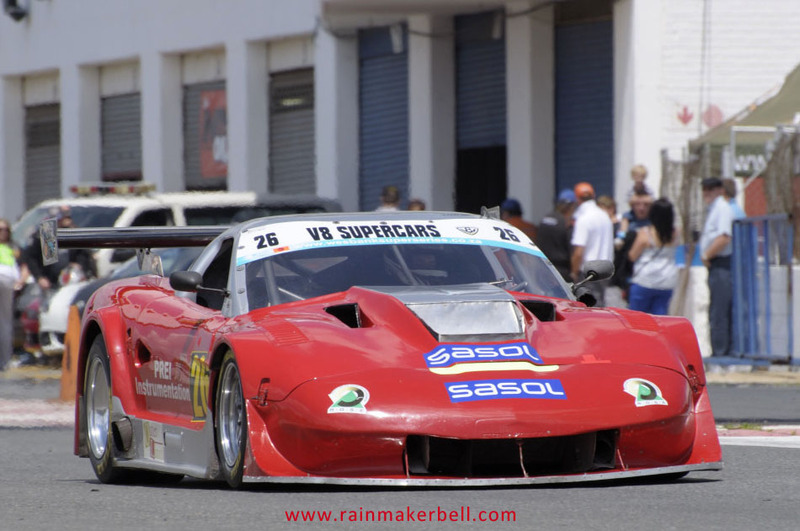 The last race of the Wesbank Super Series was held at the dilapidated Kyalami racetrack (somebody actually Googled it during the week). 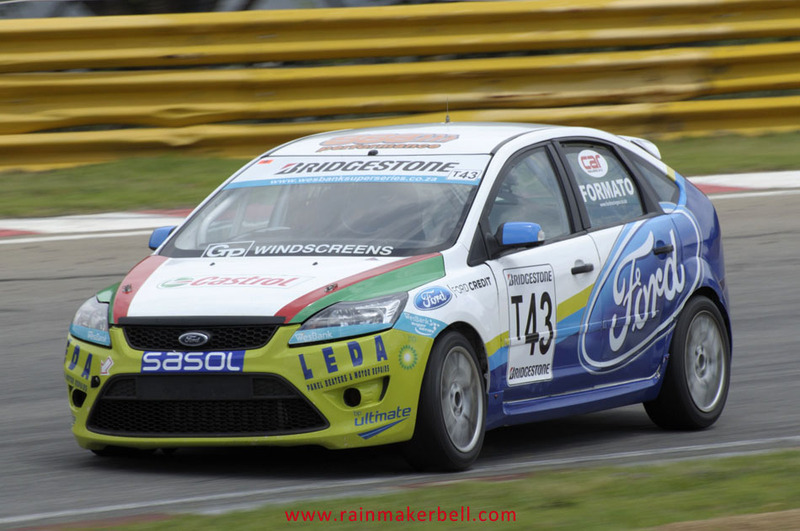 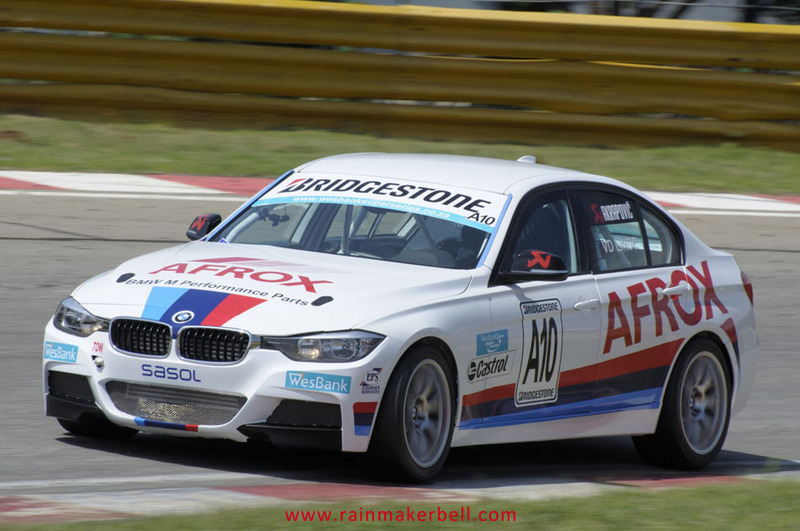 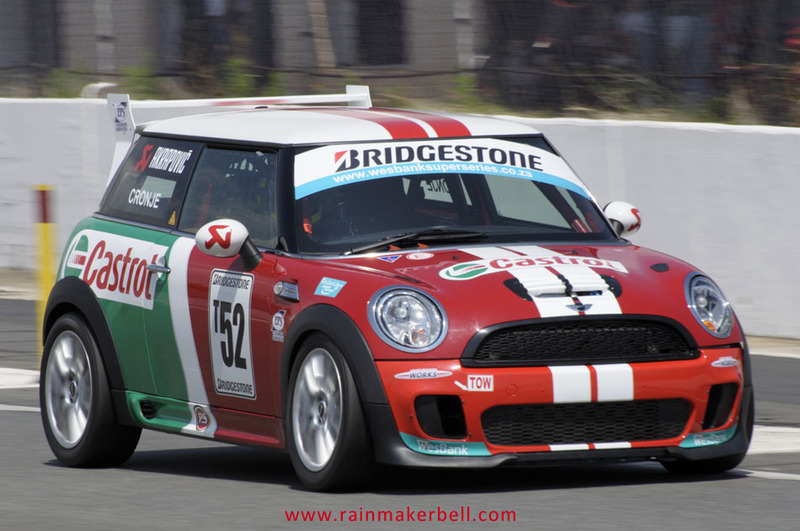 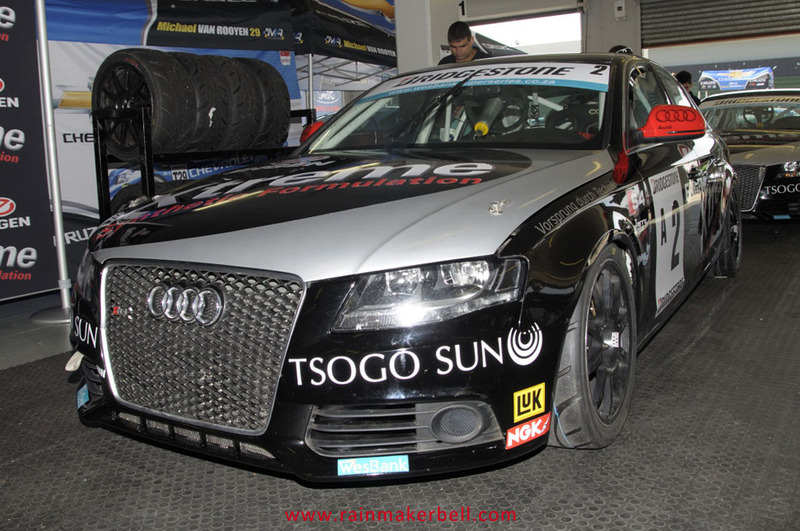 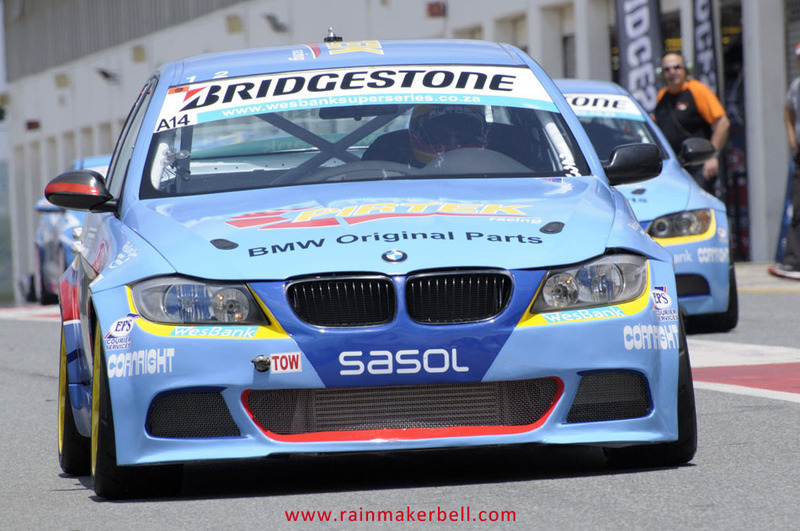 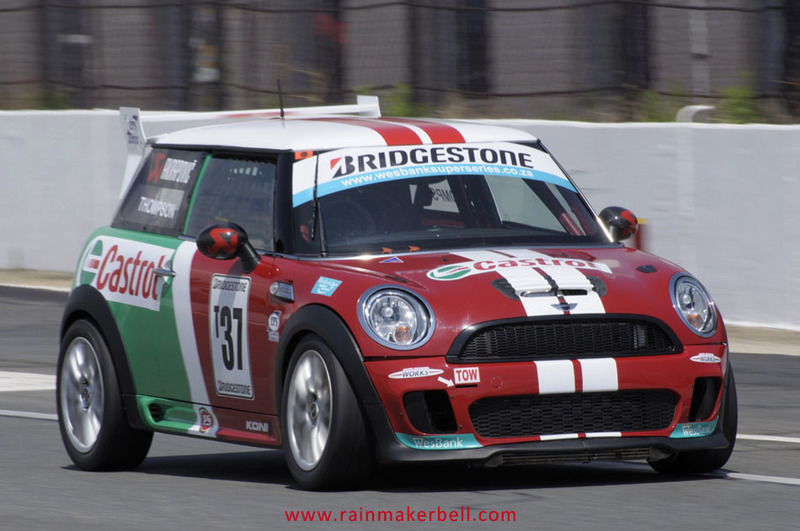 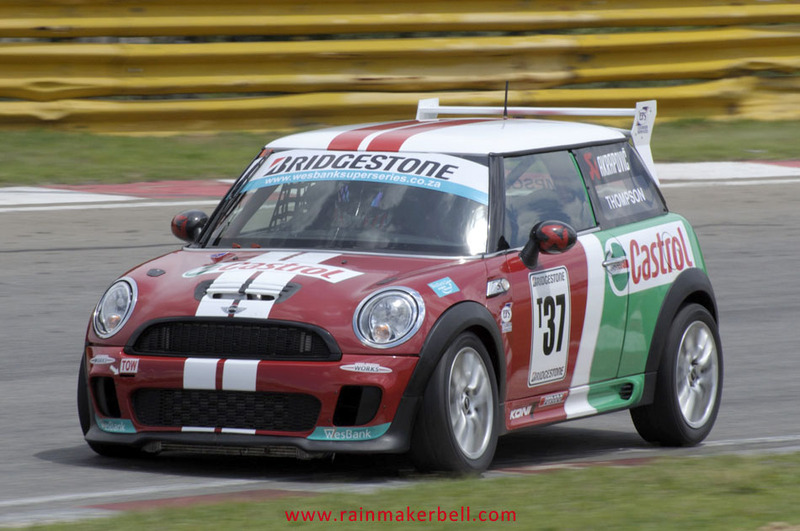 Thousands of motorsport enthusiasts descended on the racetrack vowing to enjoy the season finale of this great race event. 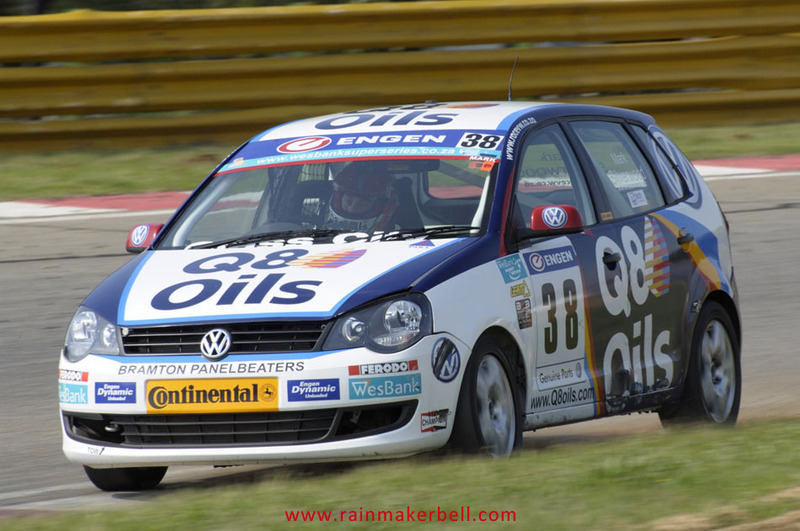 Unfortunately there is also the poignant rumour doing the rounds that Wesbank is untethering itself from this prolific series come 2013 (if you have more specifics please drop me a mail). 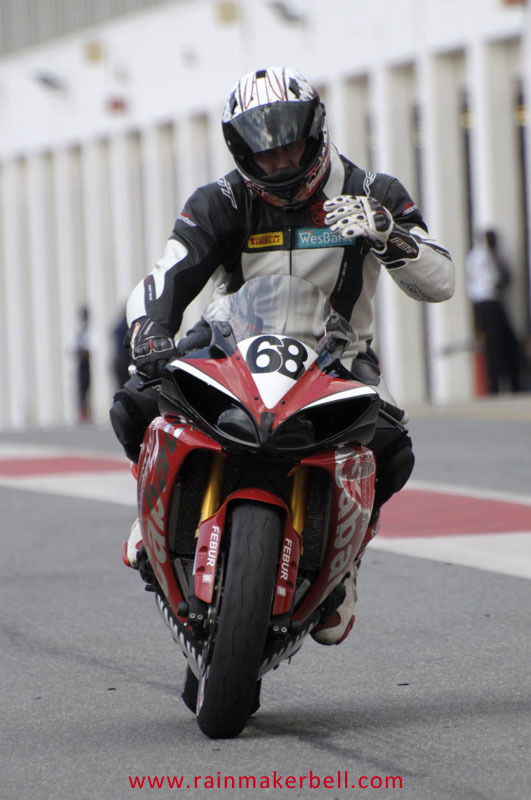 On the lighter side though, what would any race event be without the loadbearing influence of the motorcycle classes, in this case the Superbikes and Supersport 600. 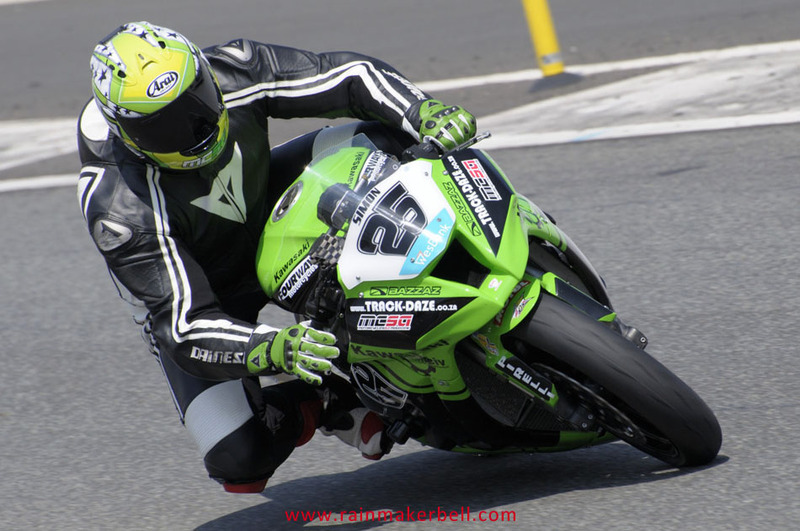 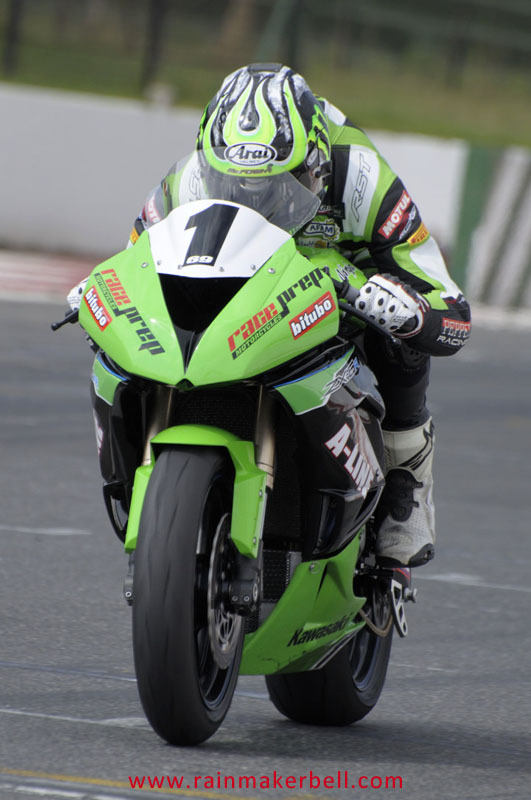 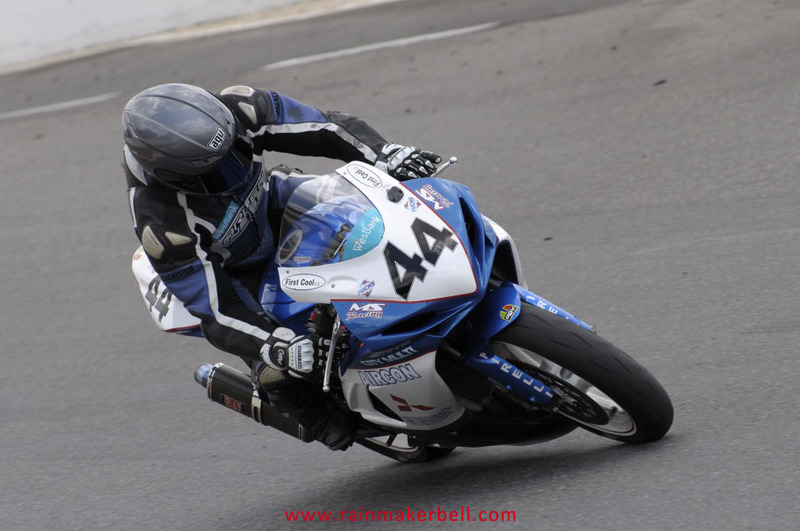 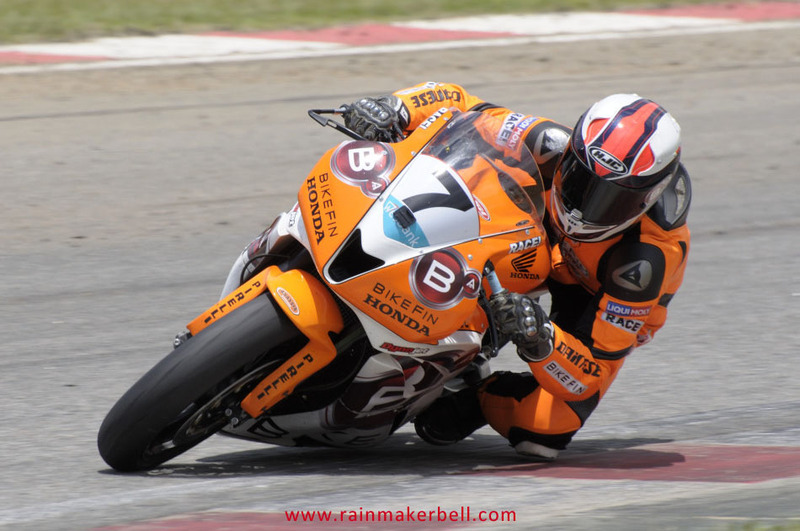 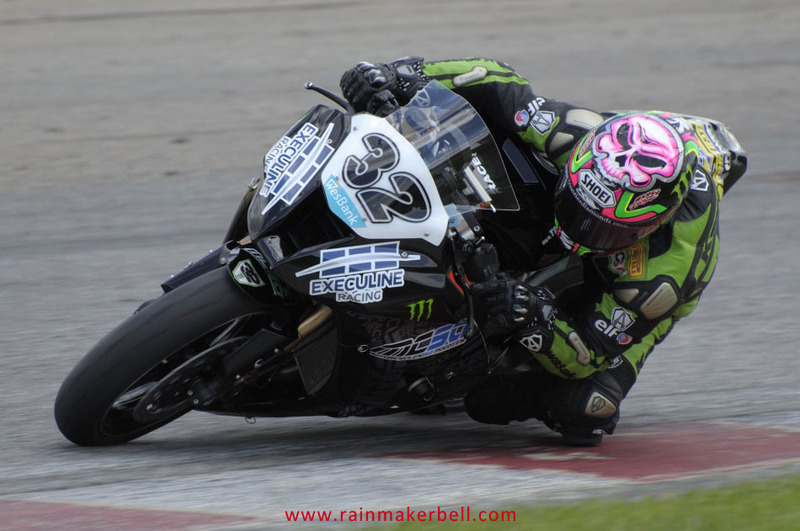 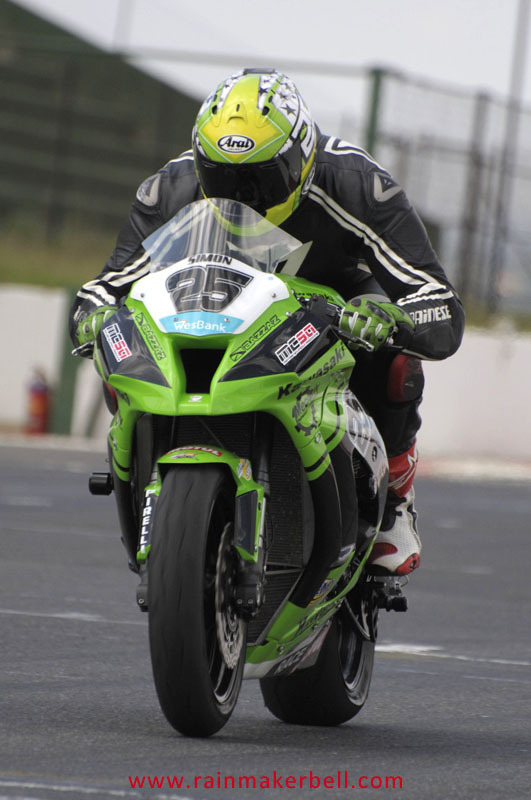 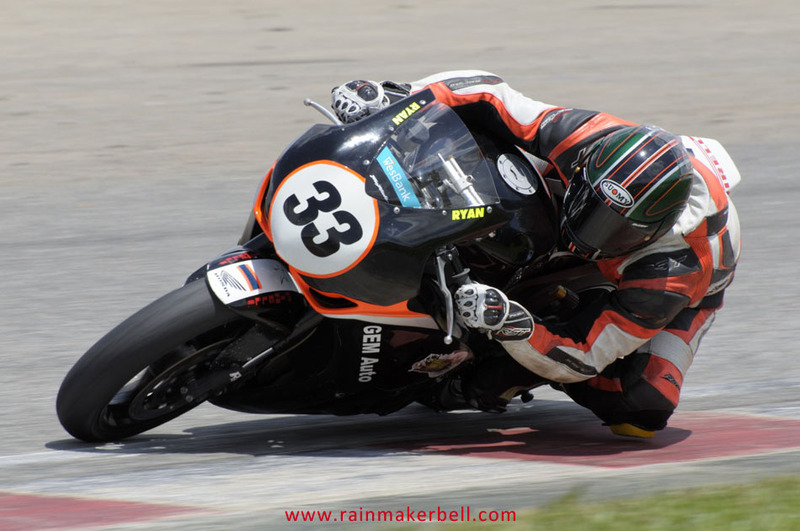 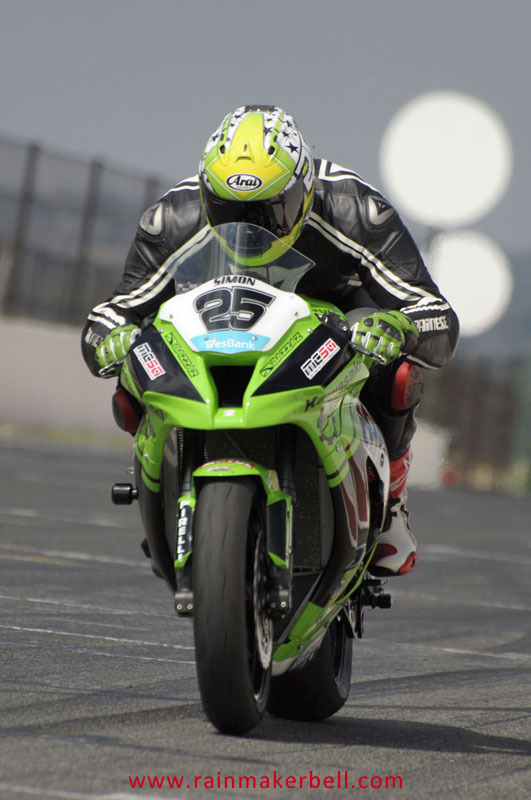 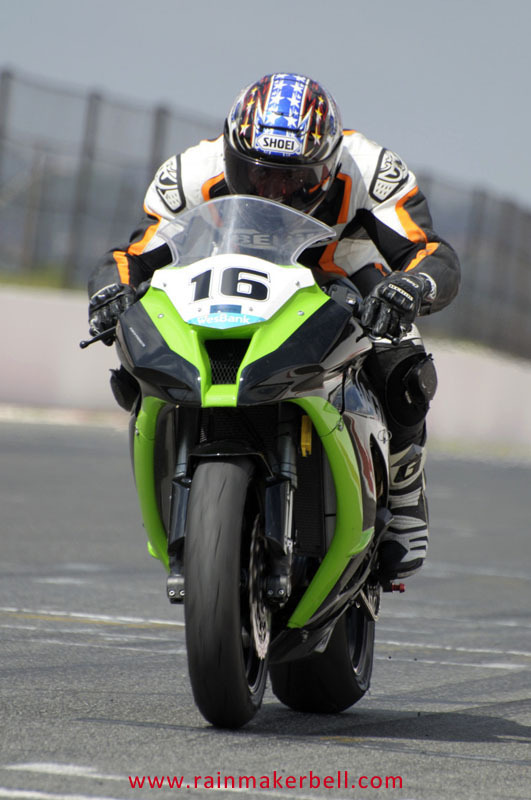 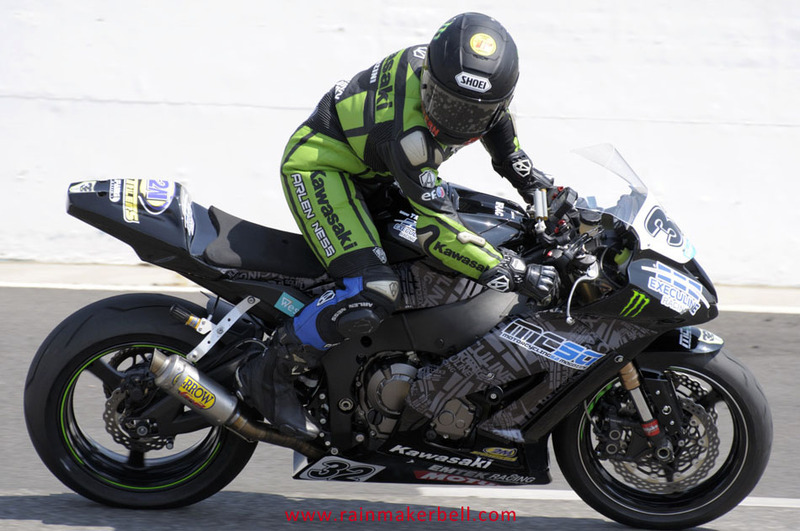 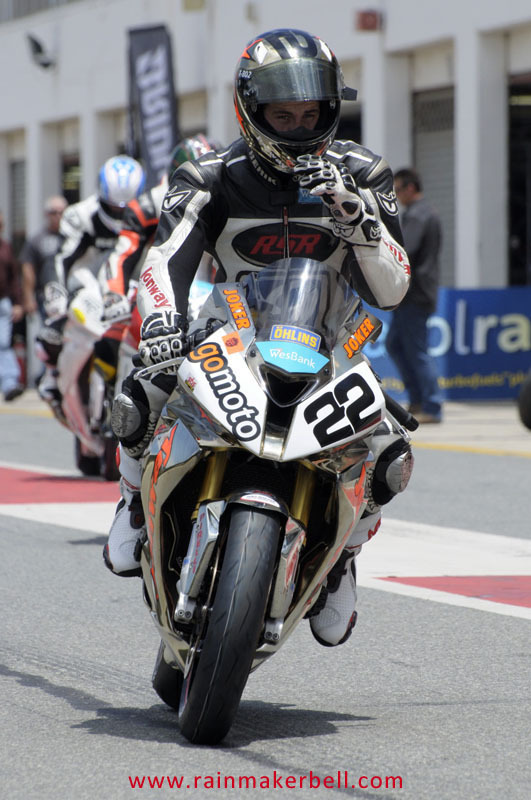 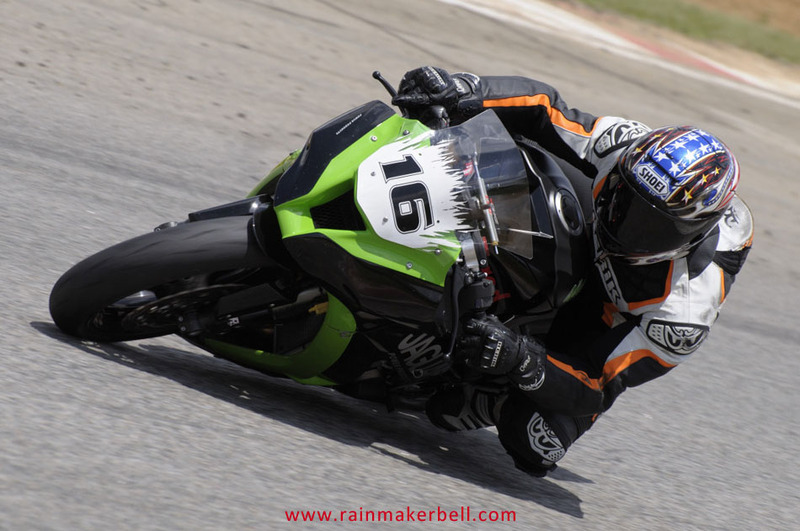 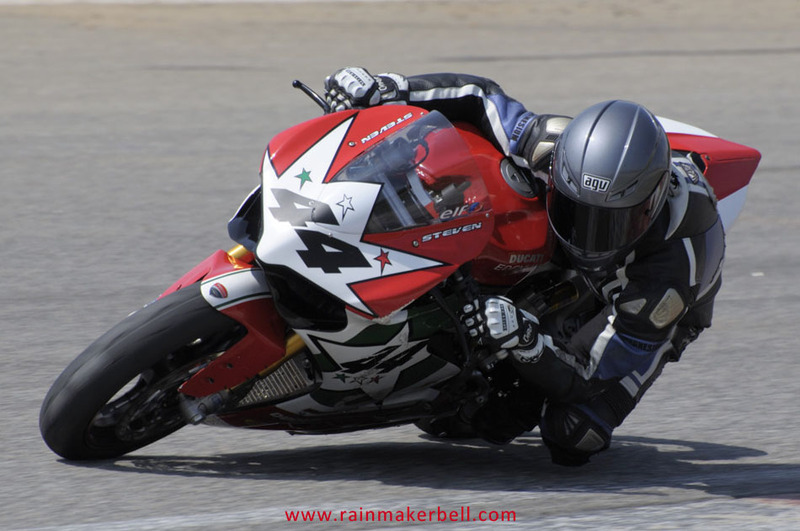 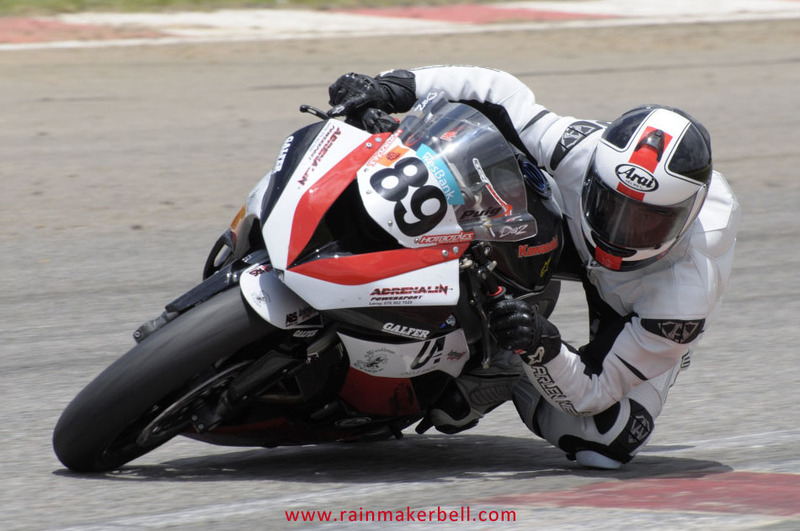 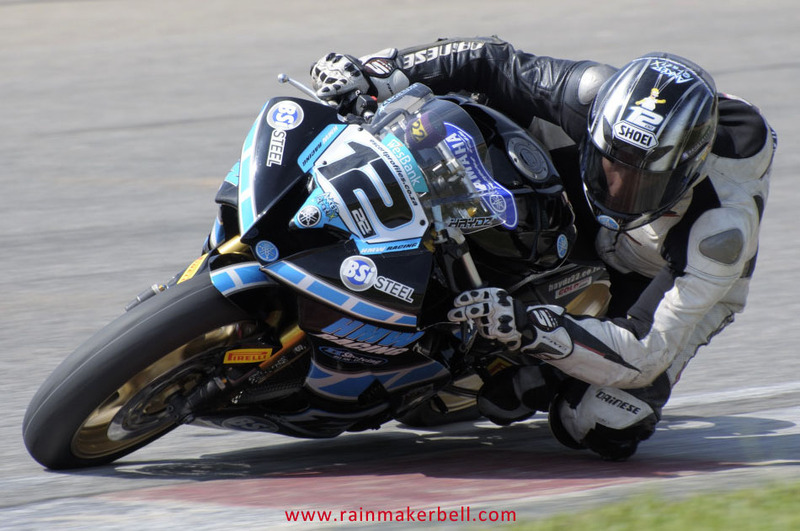 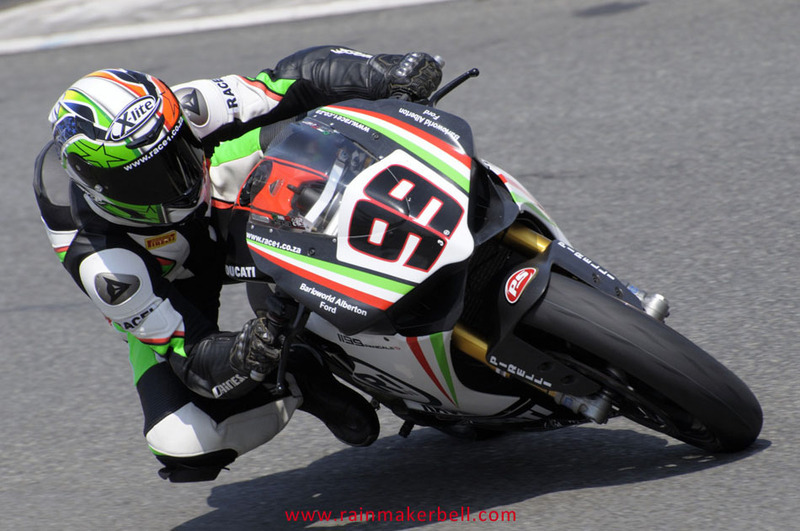 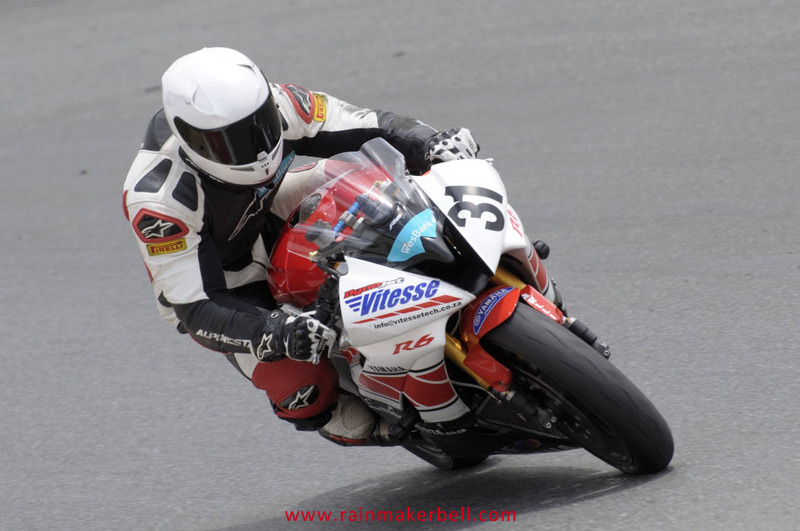 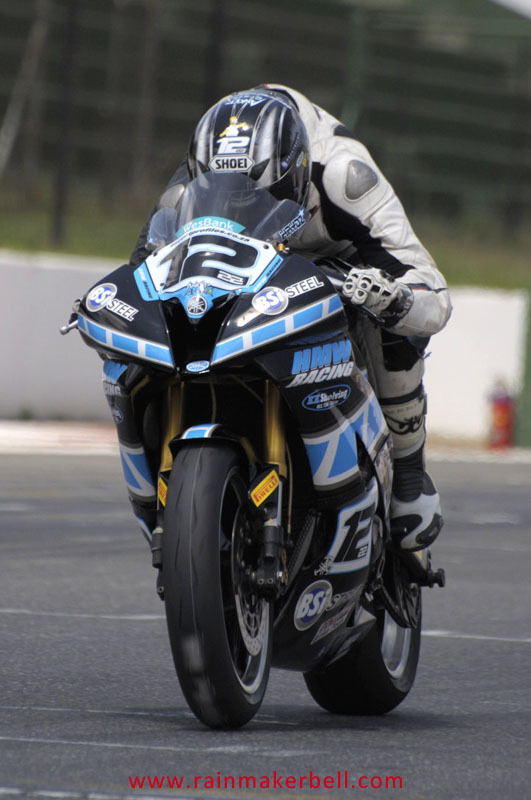 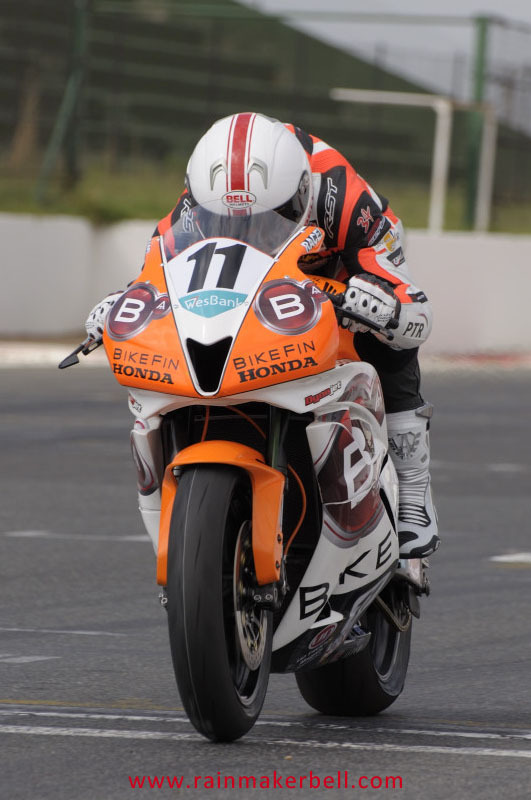 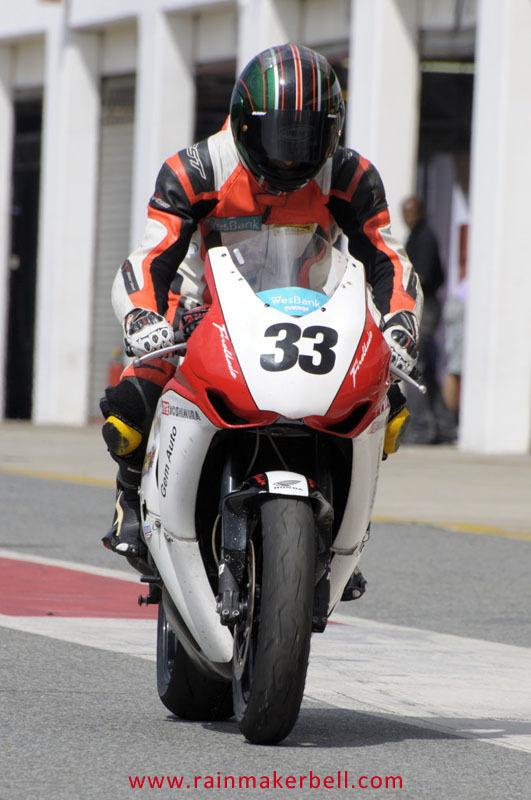 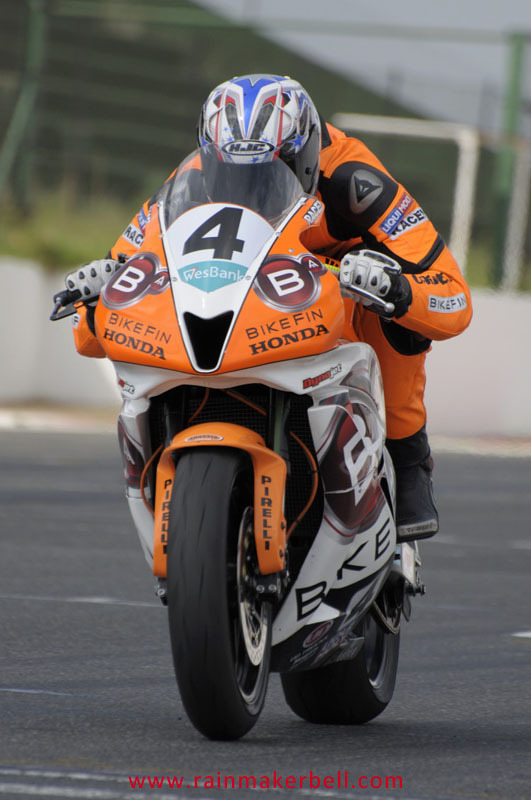 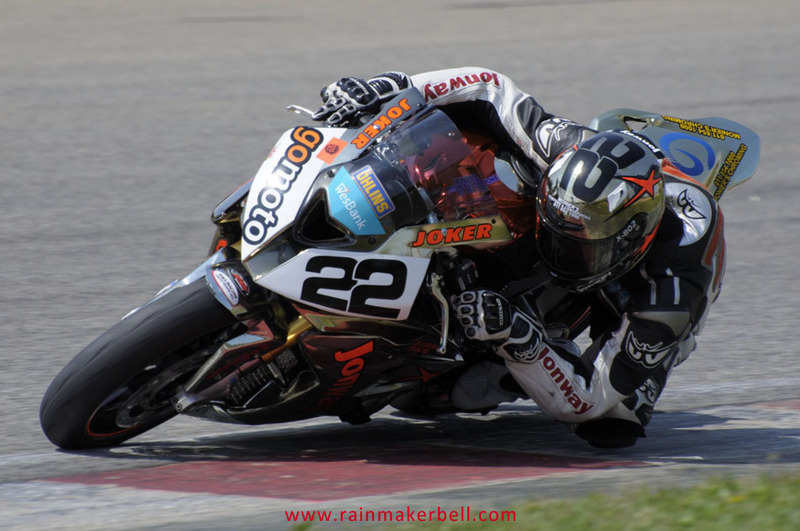 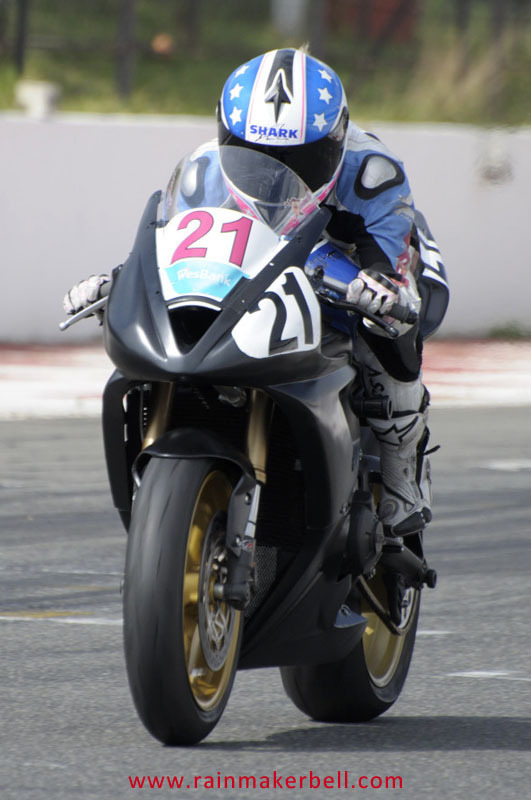 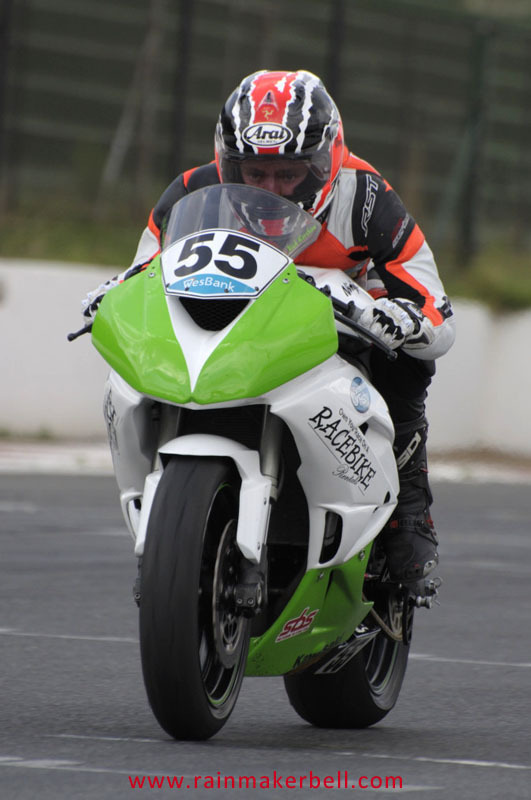 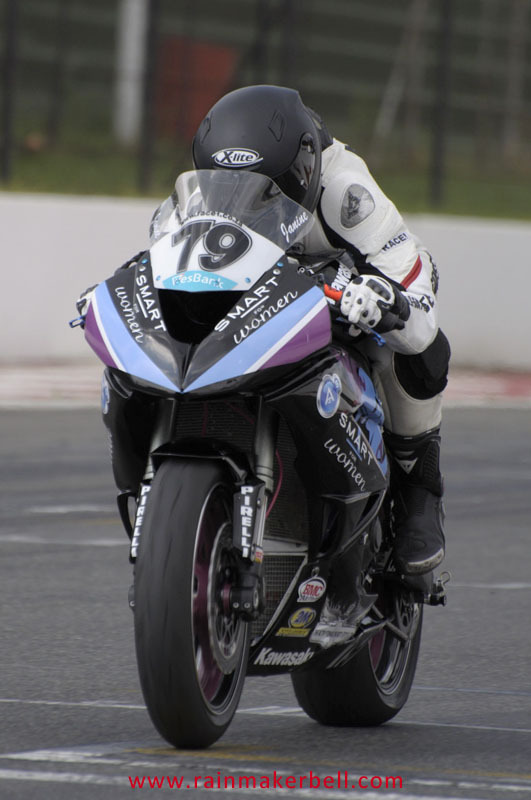 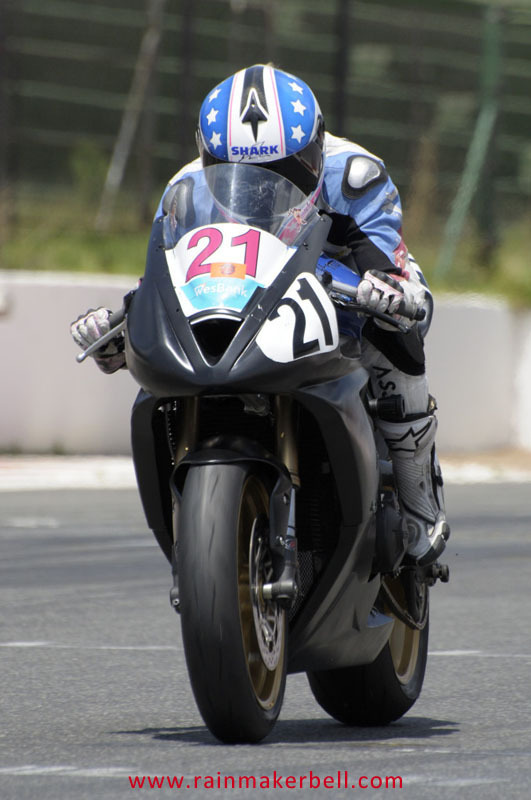 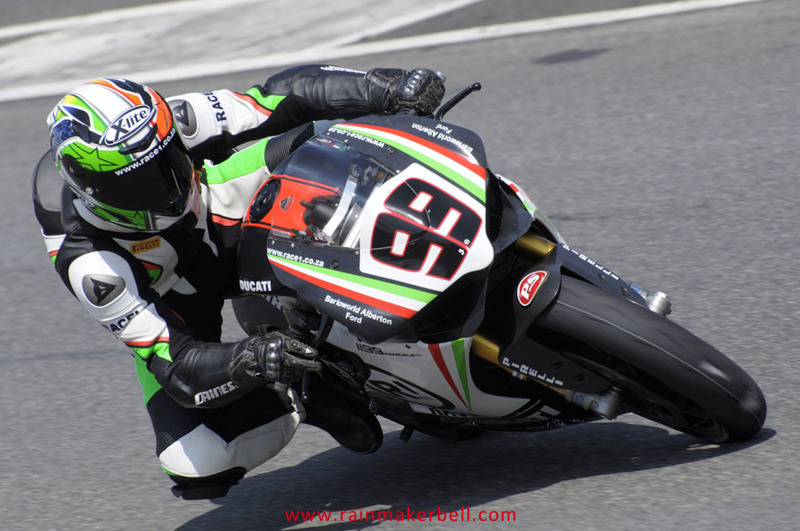 Greg Gildenhuys knocked back a few teeth in the Superbike class; with his fast and furious (maybe just fast) riding style to ensure that the crown is his for the third consecutive year (he actually bagged the title at the previous race event). 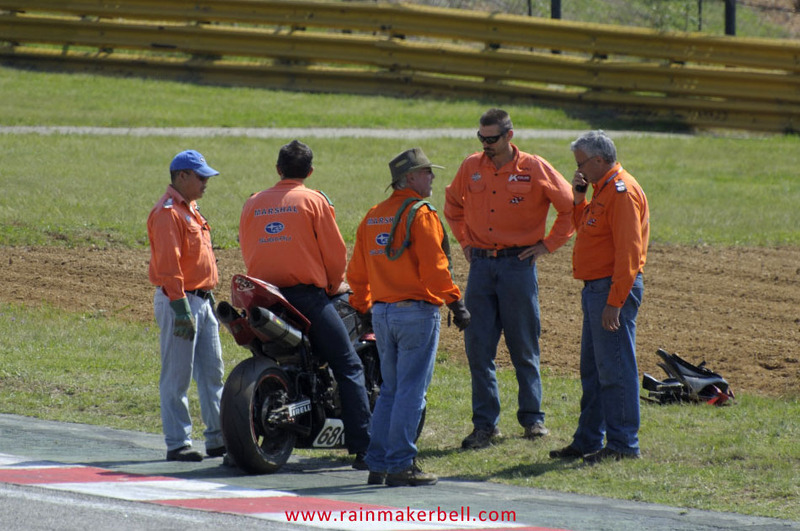 The rest of the Superbike scoot jockeys put up a good fight until the last drop of fuel evaporated. 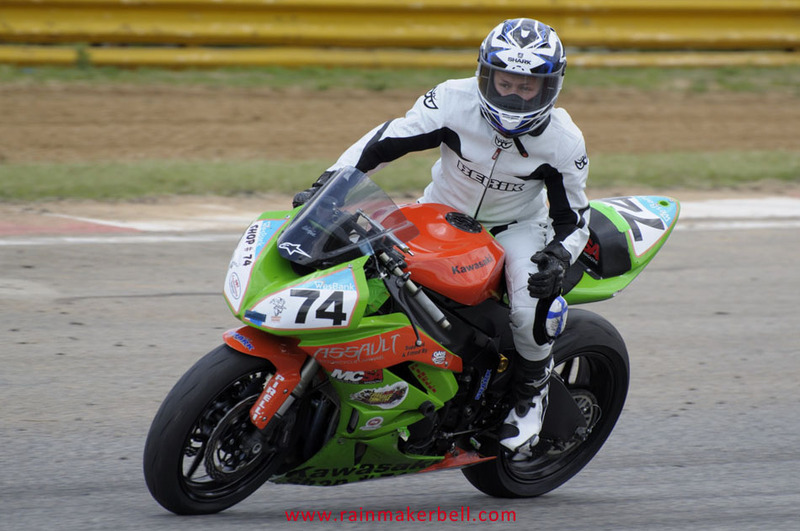 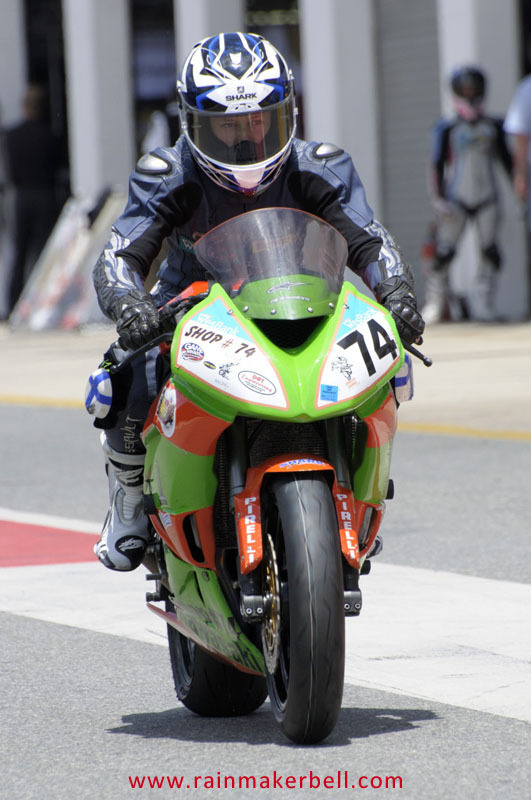 A great battle continued in the Supersport 600 class between the real orange men of this country and Steven Odendaal #44 (Suzuki GSXR600). 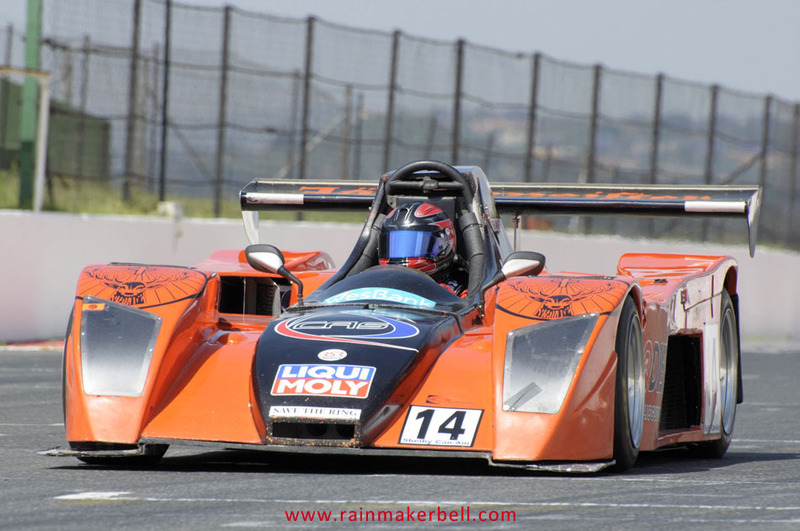 Not even their imposing orange façade could dent Steven’s #44 armour, who won both races. 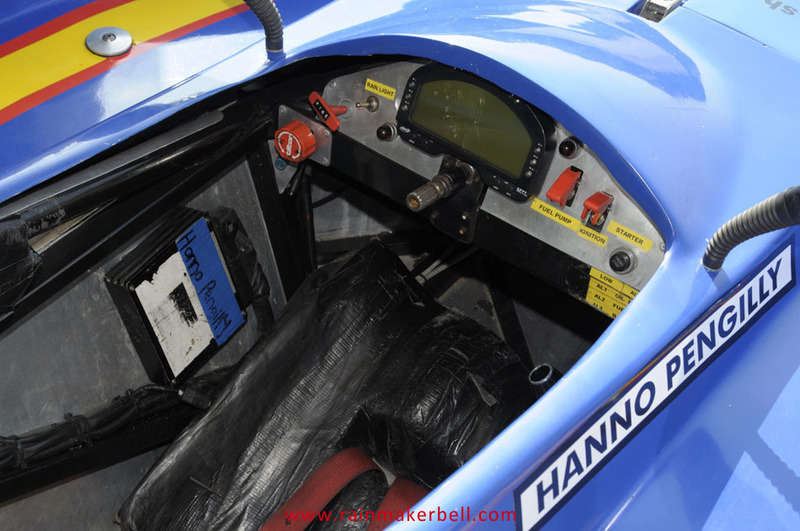 The time has come to hang up the race gear until next season. 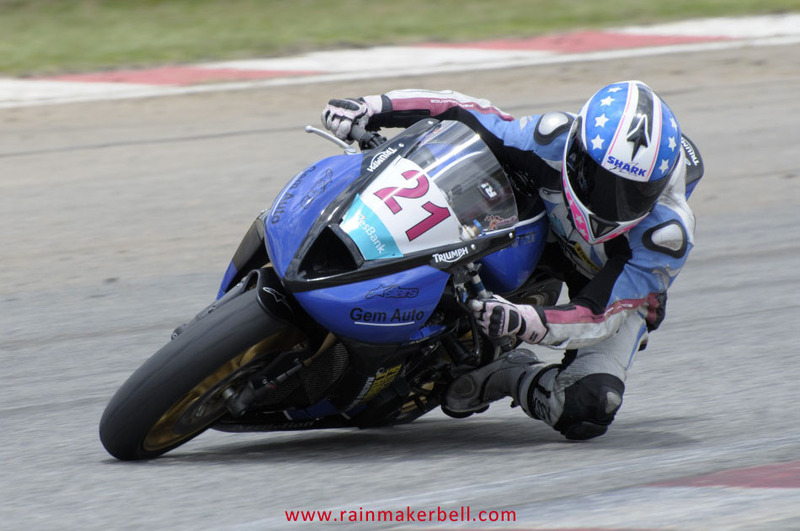 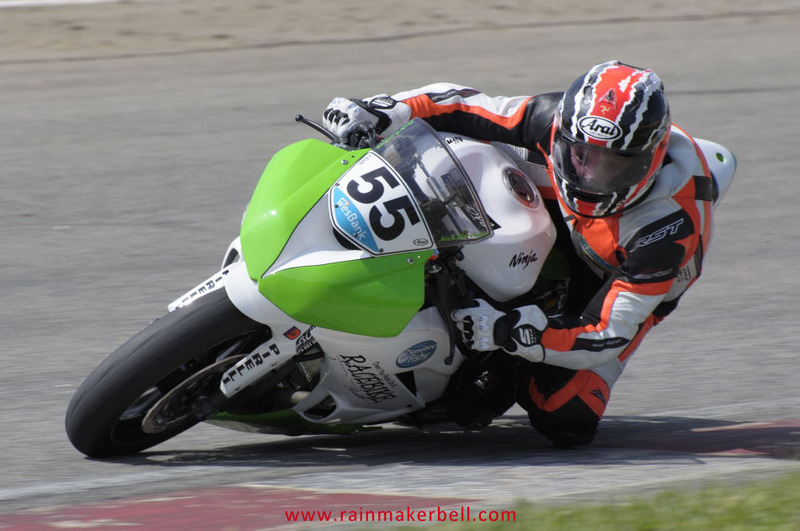 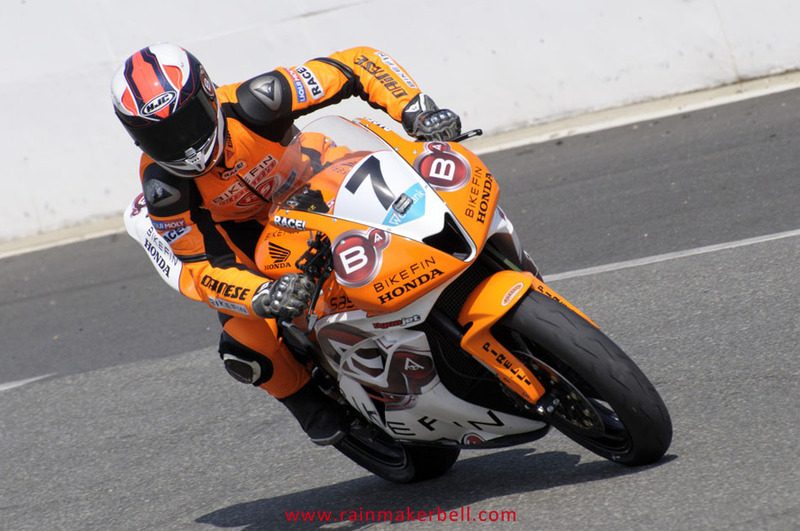 The race day was not all about motorcycle races. 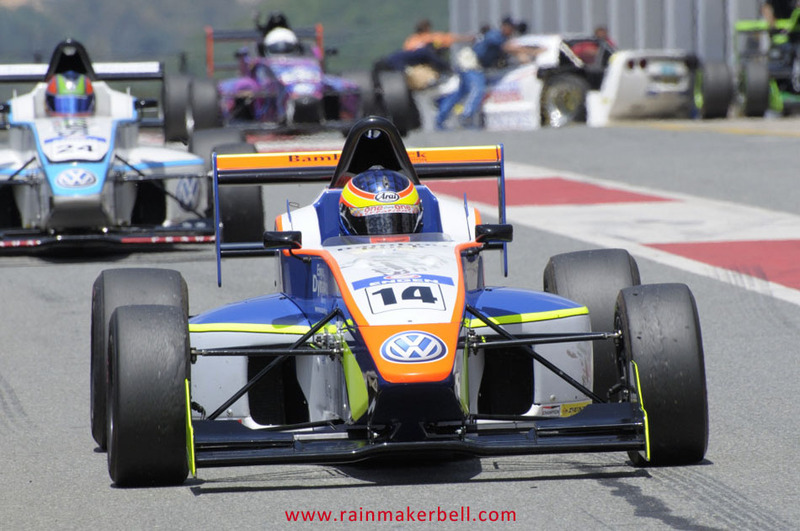 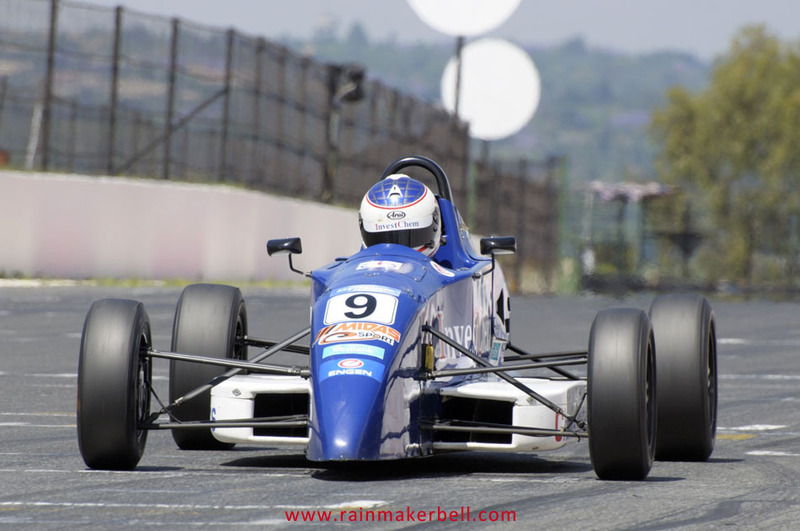 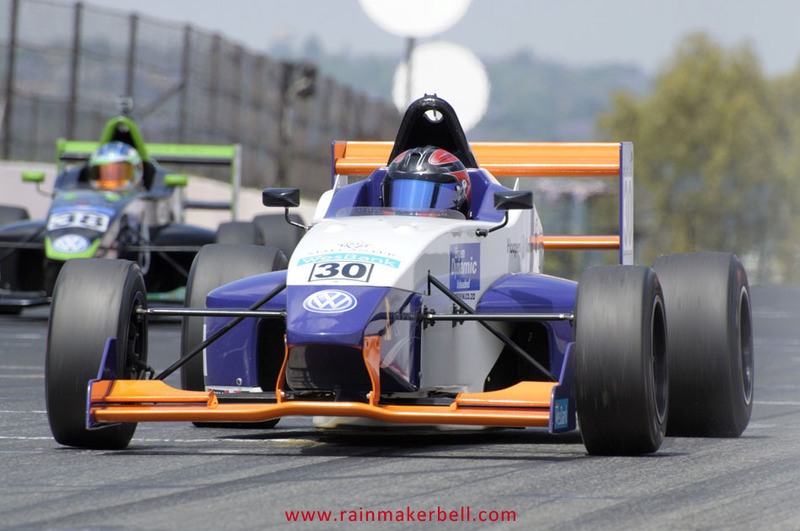 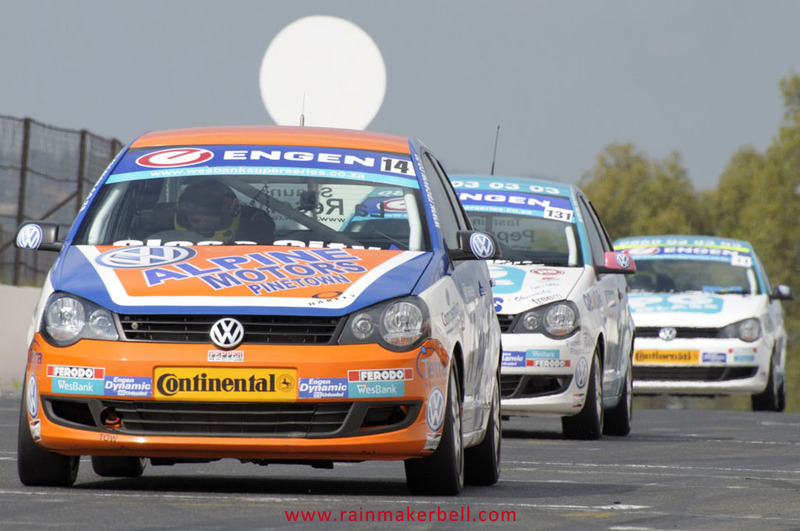 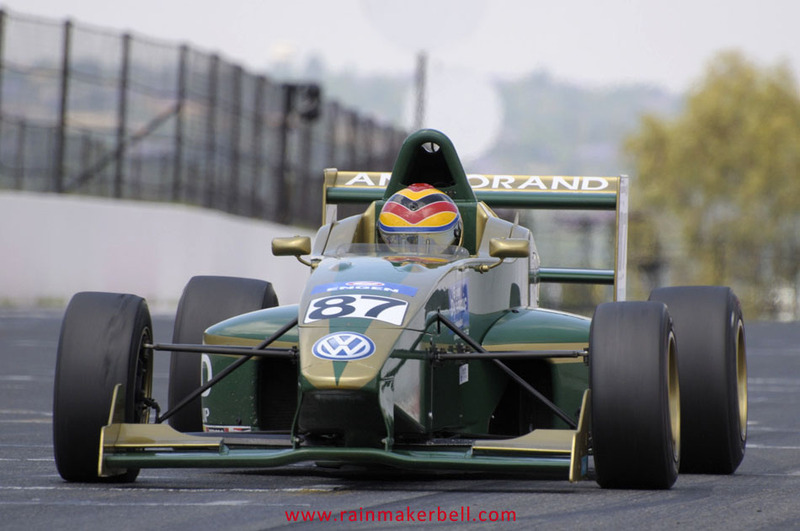 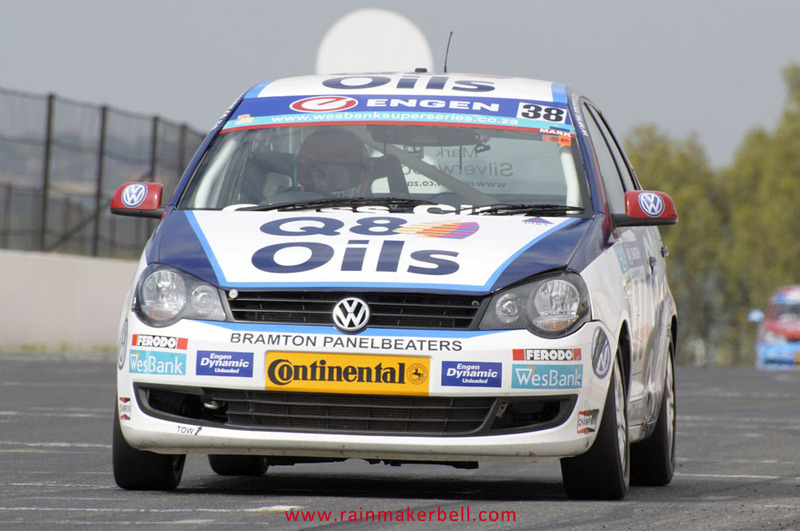 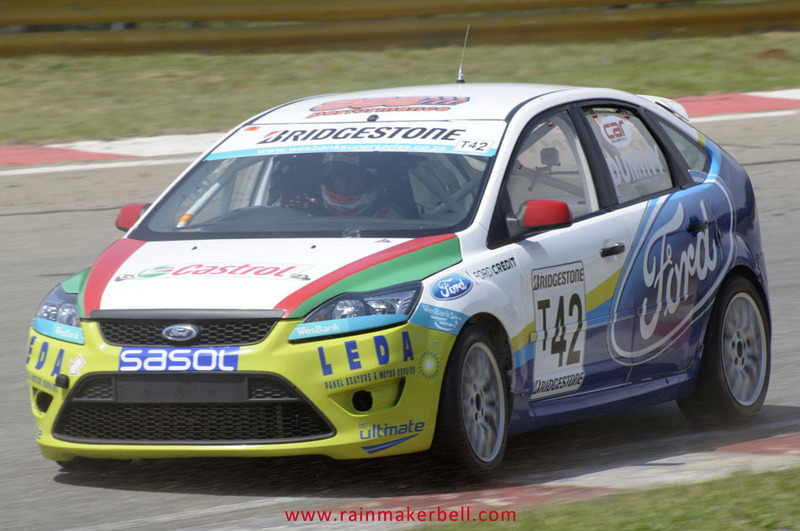 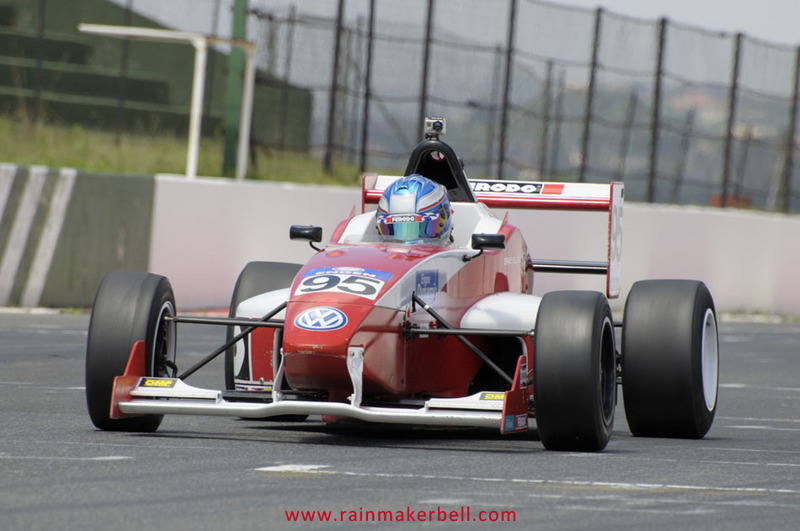 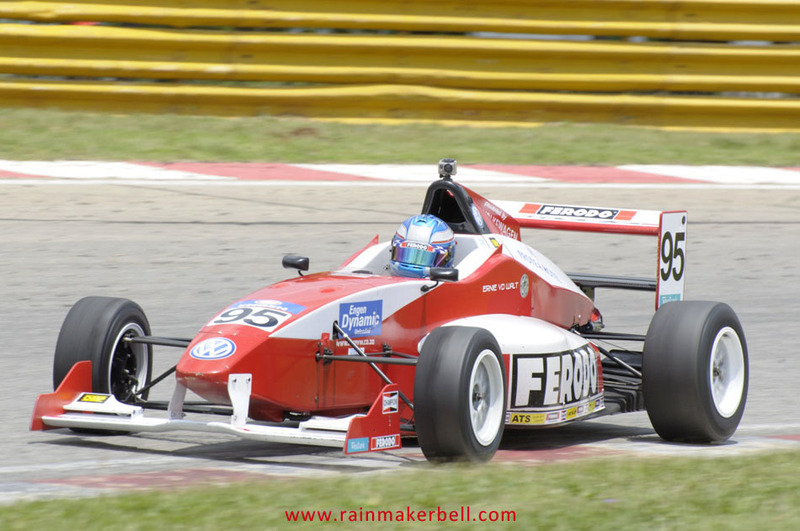 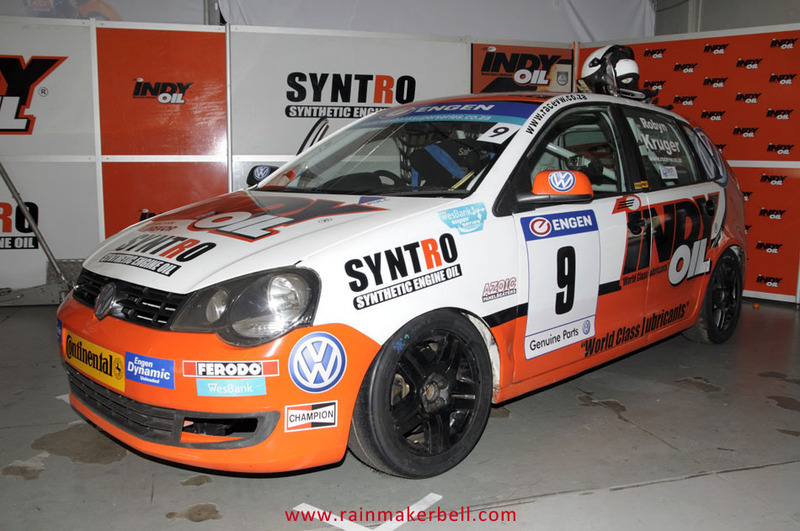 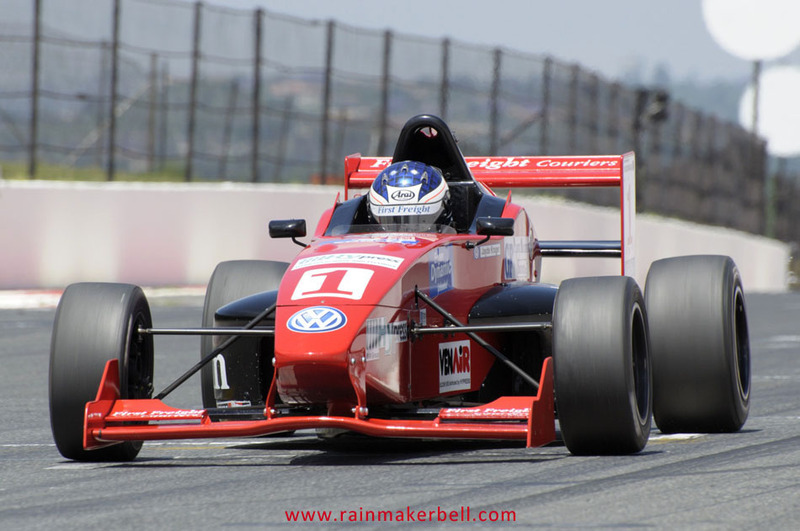 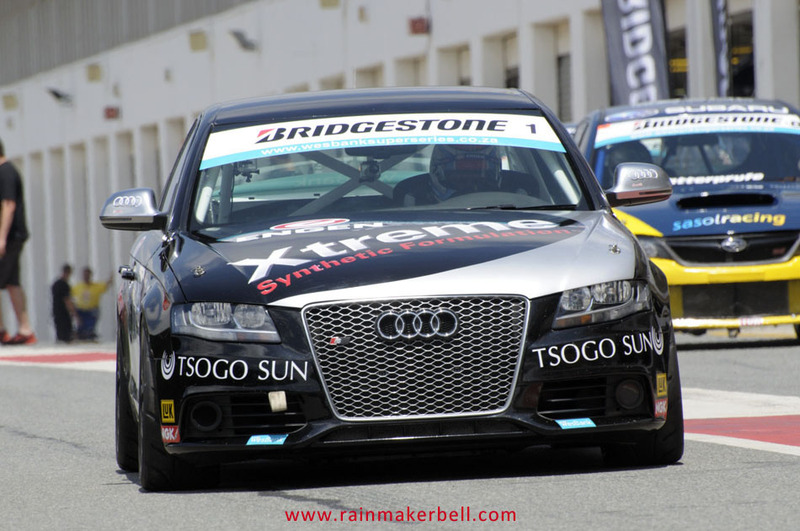 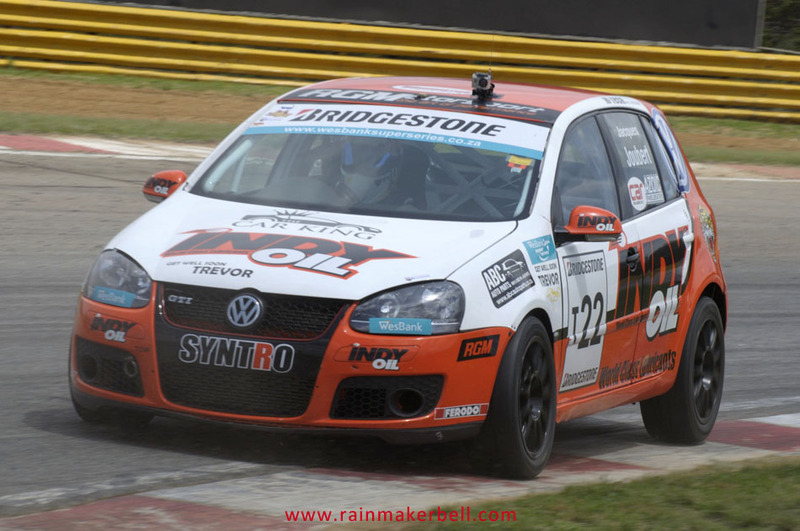 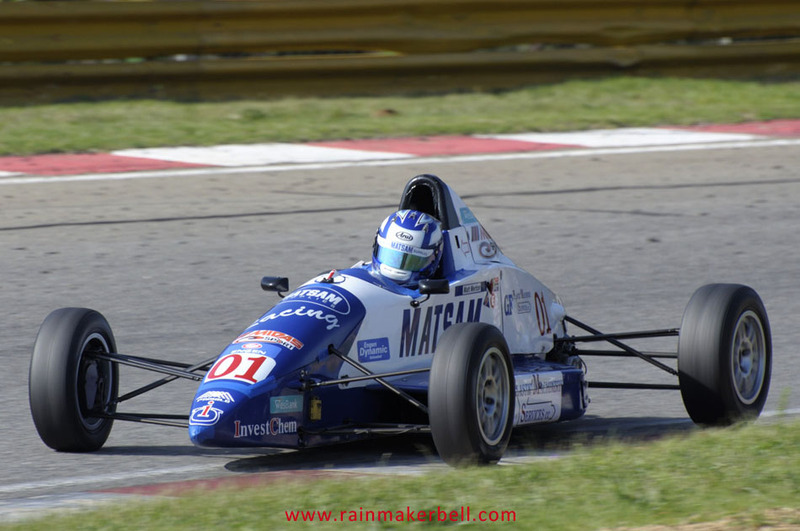 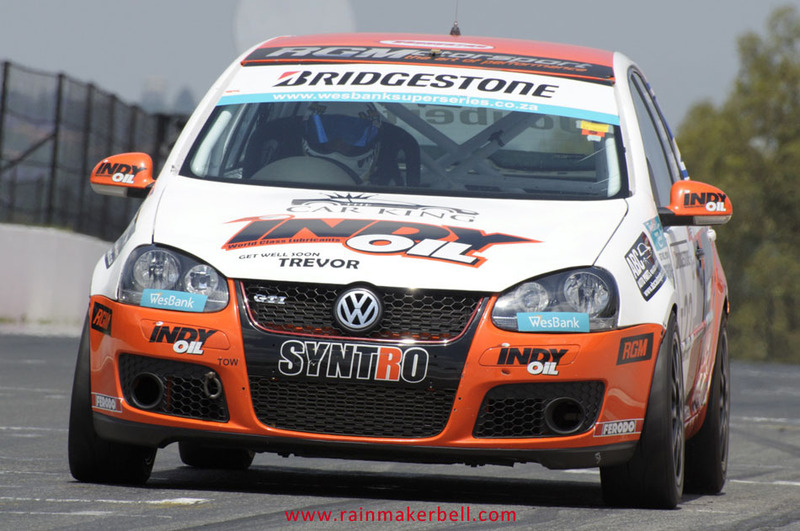 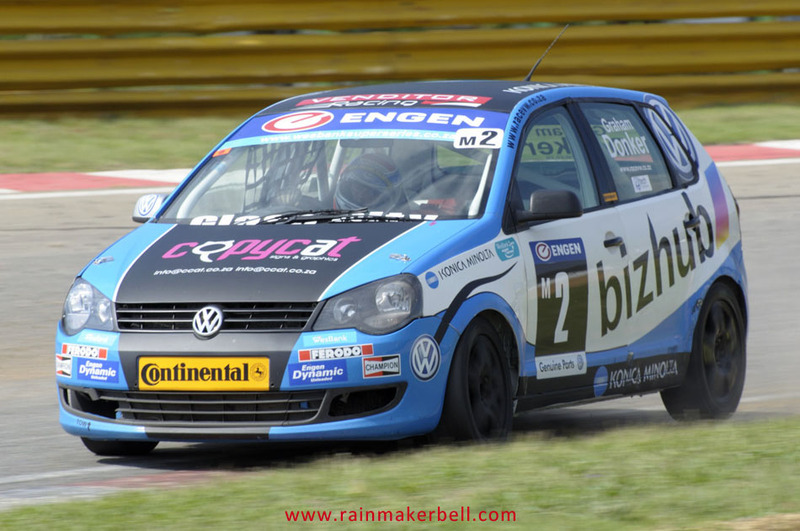 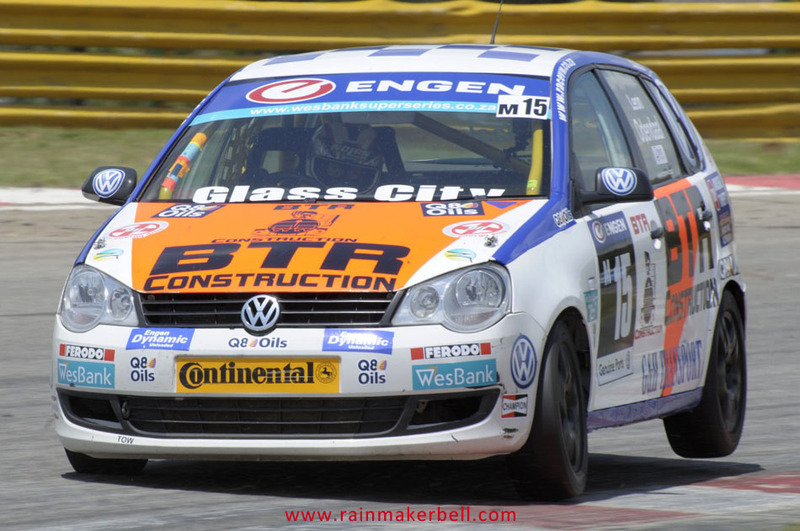 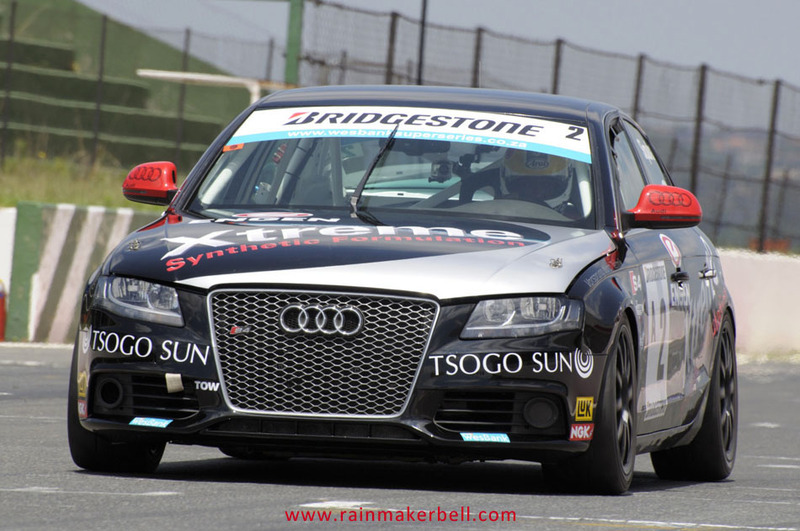 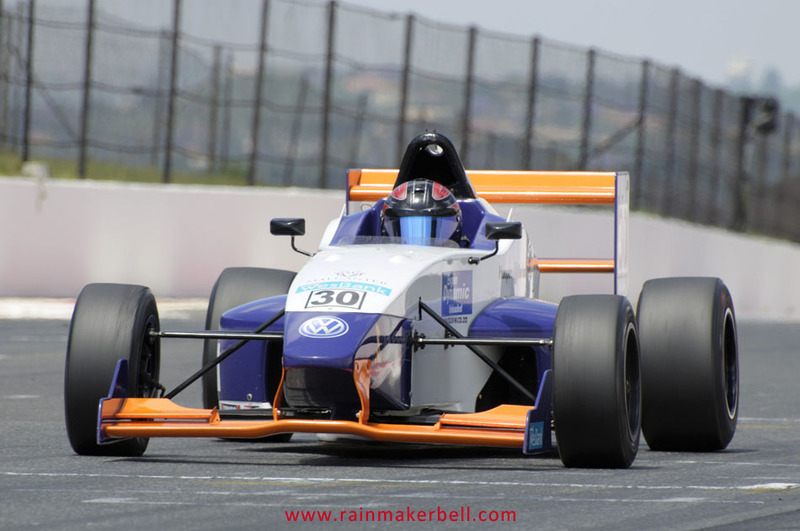 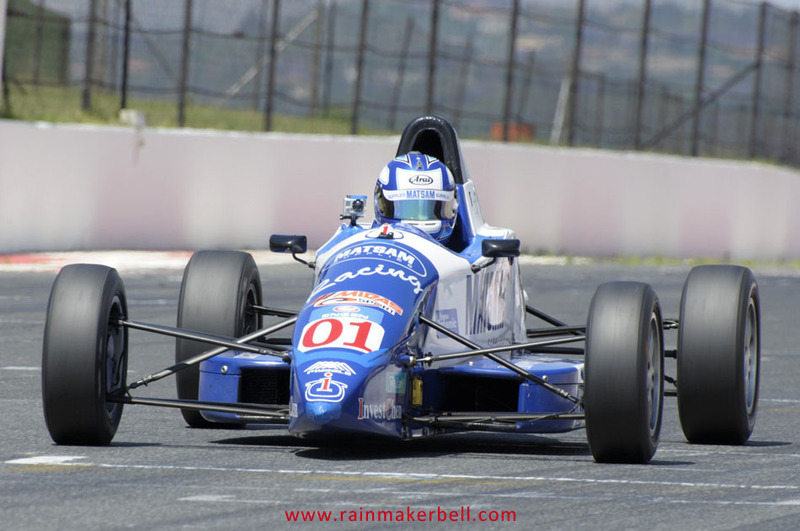 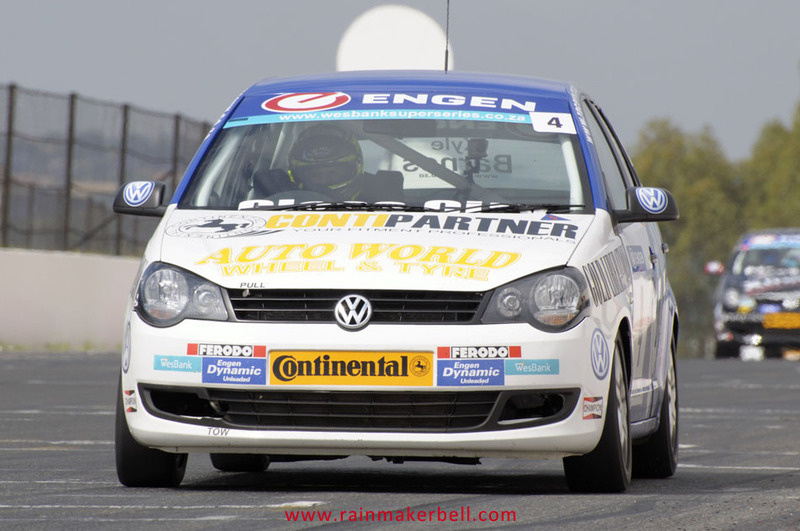 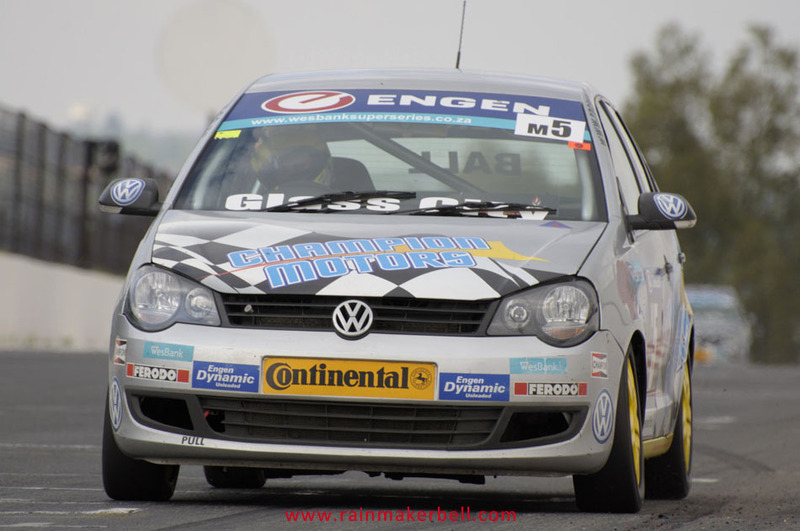 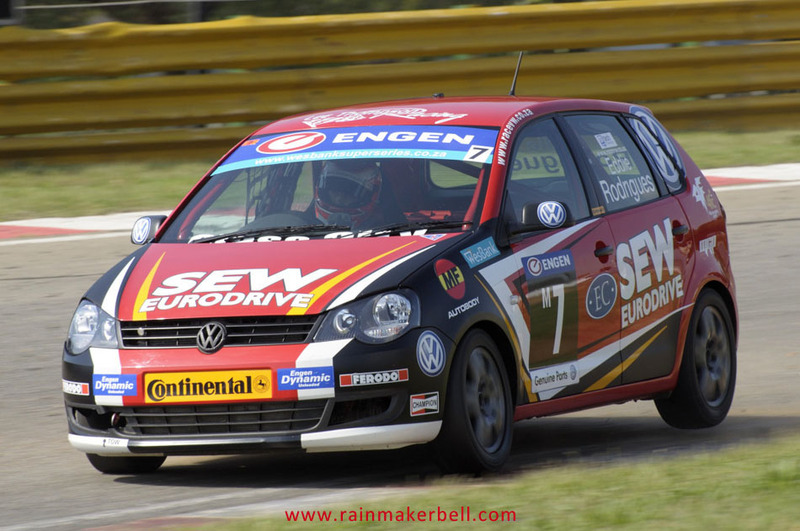 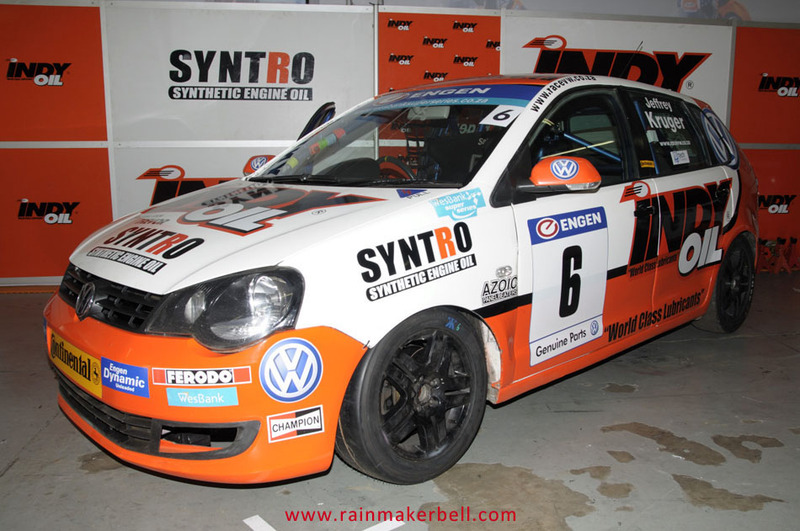 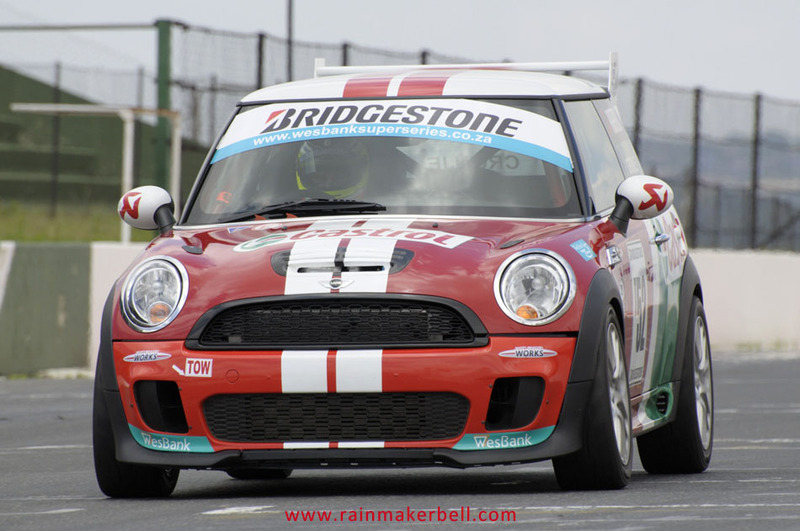 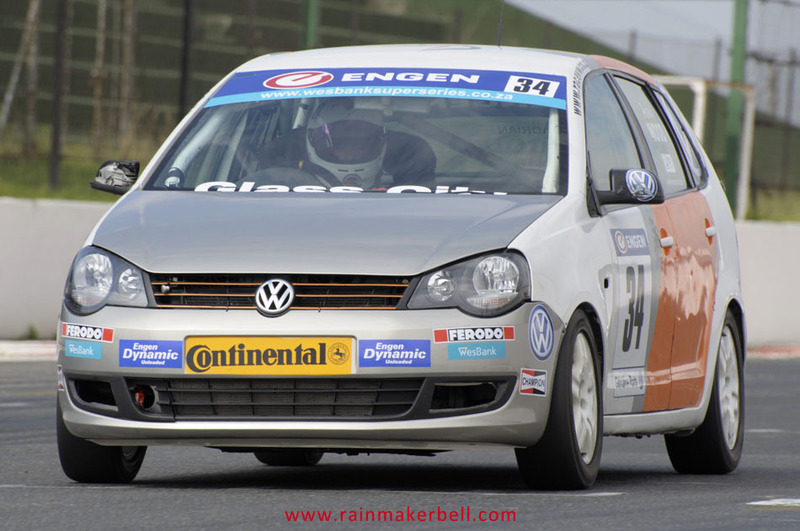 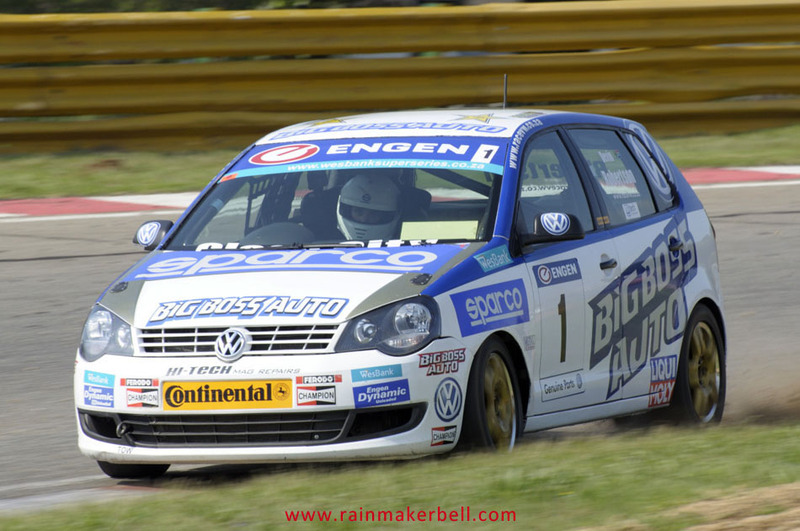 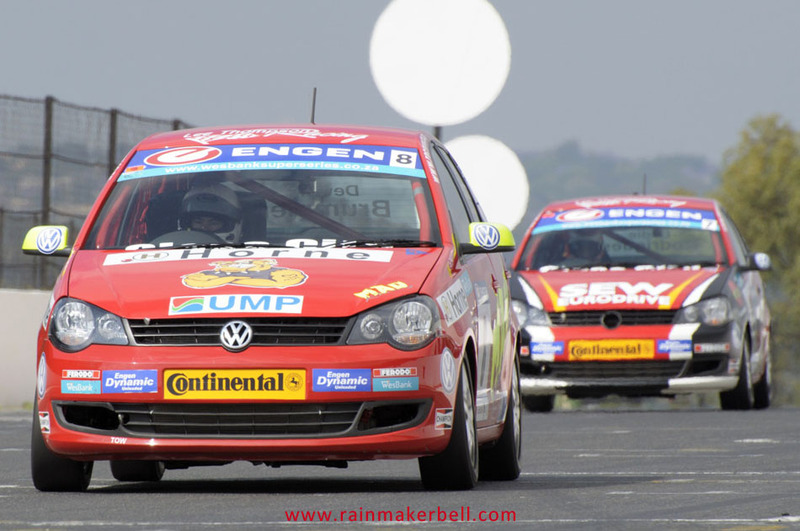 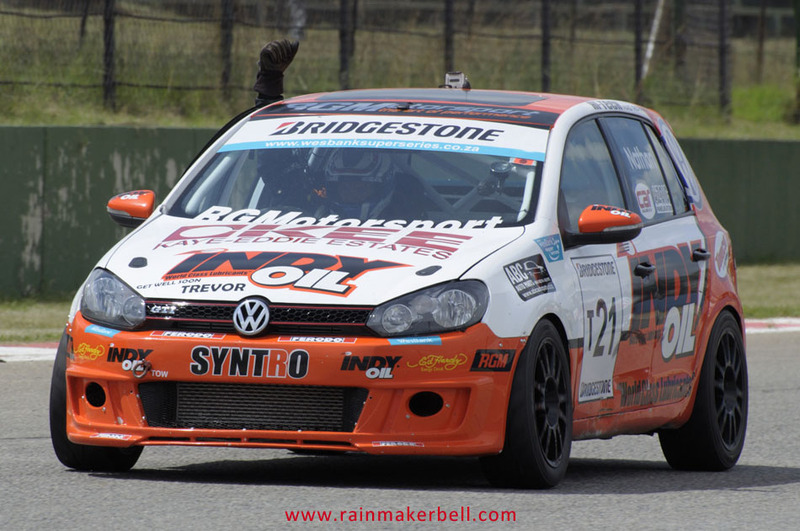 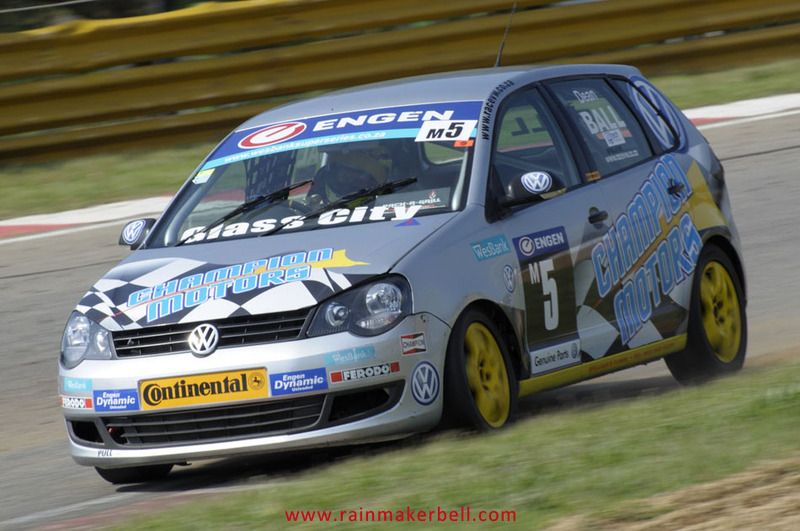 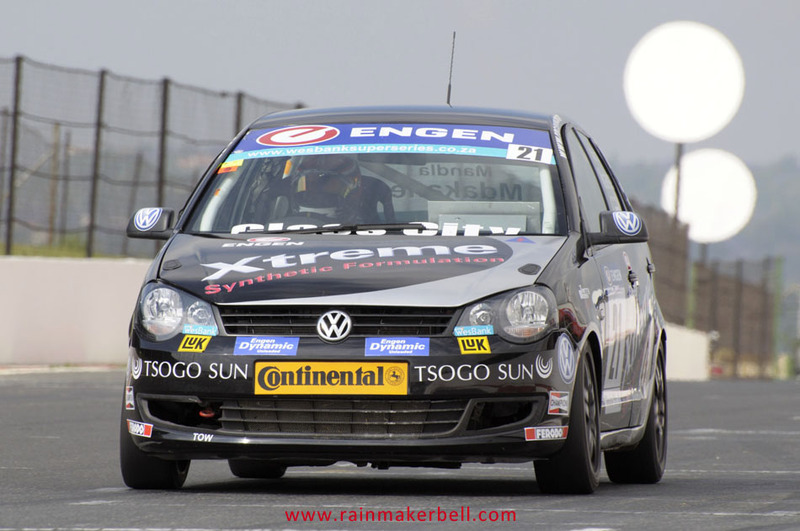 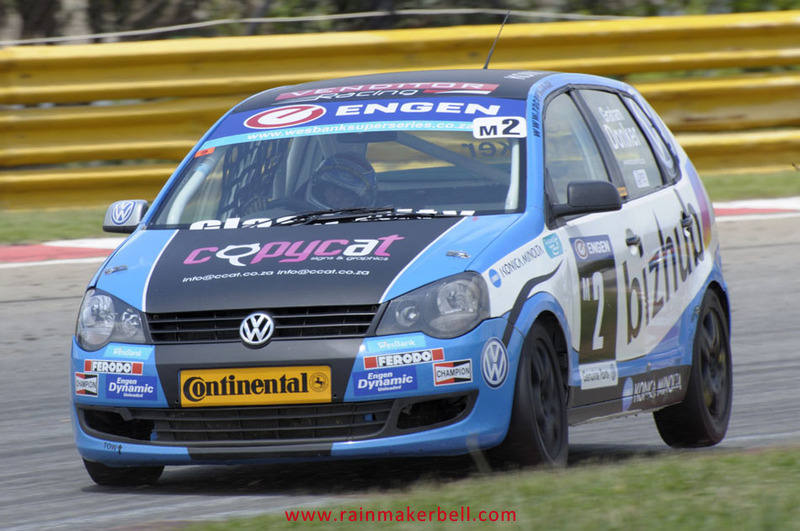 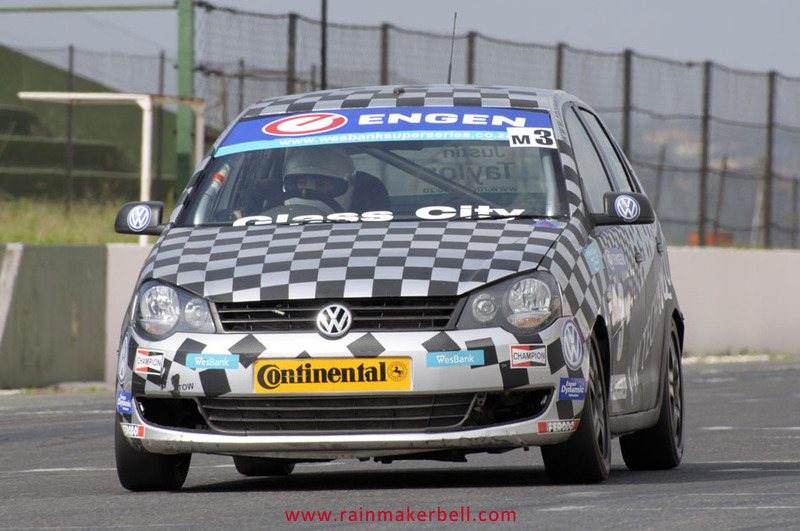 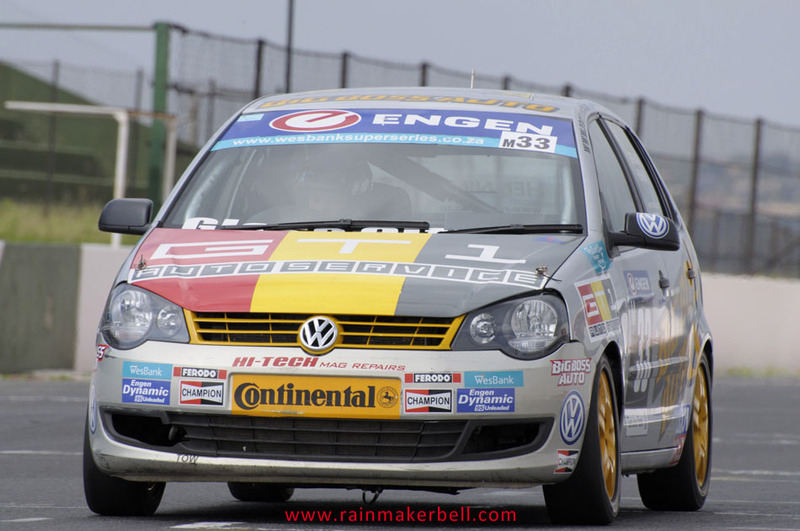 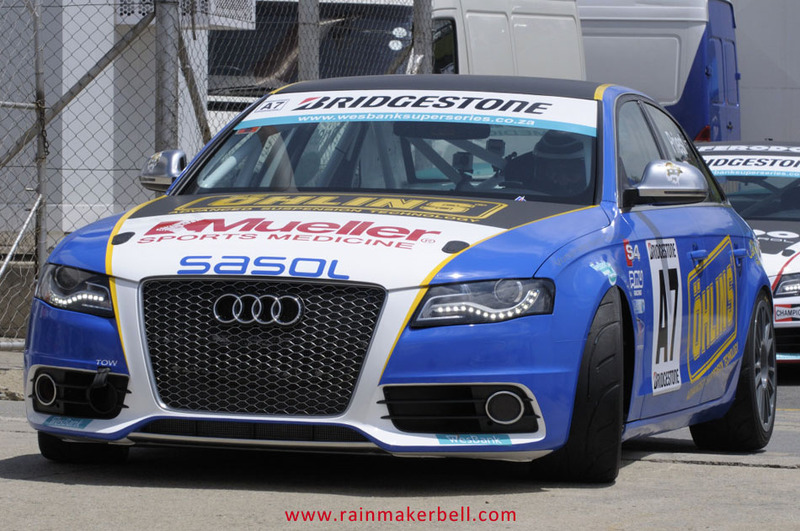 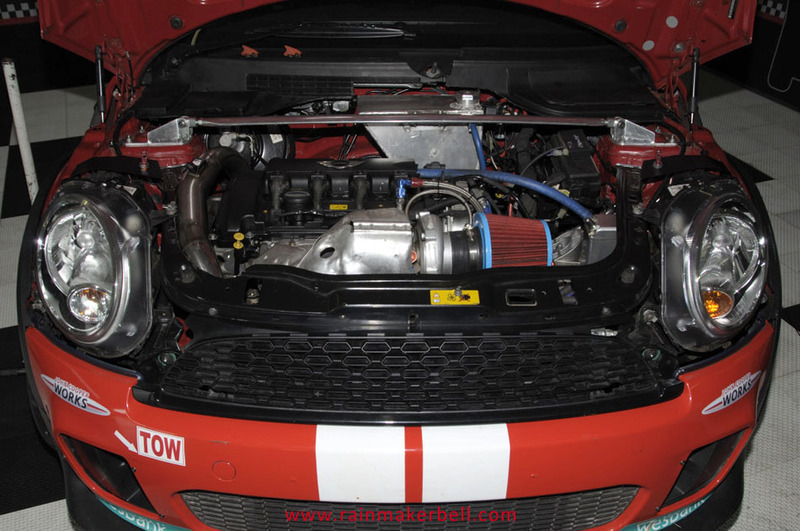 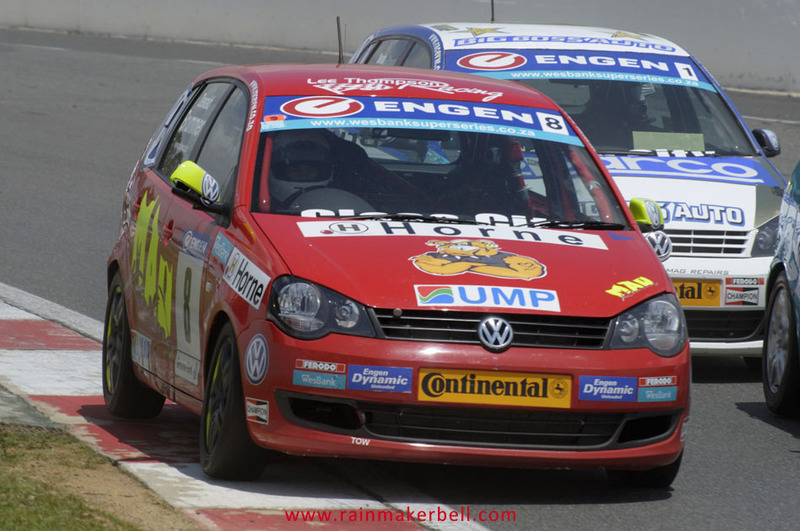 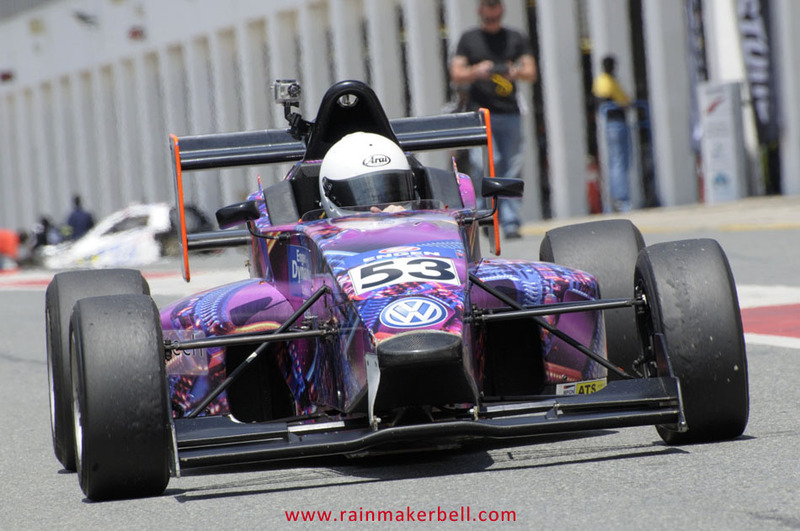 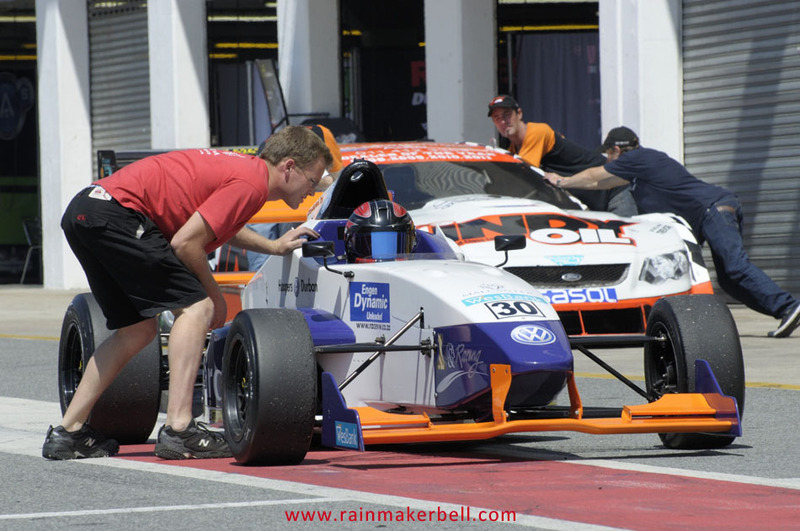 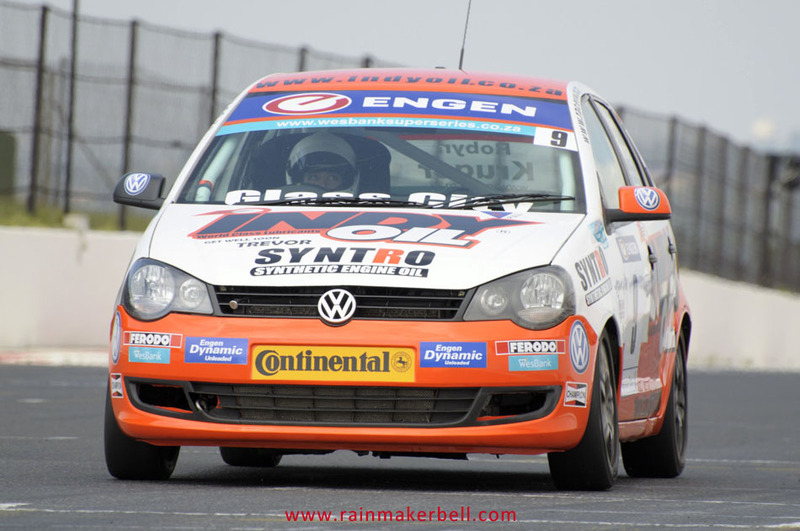 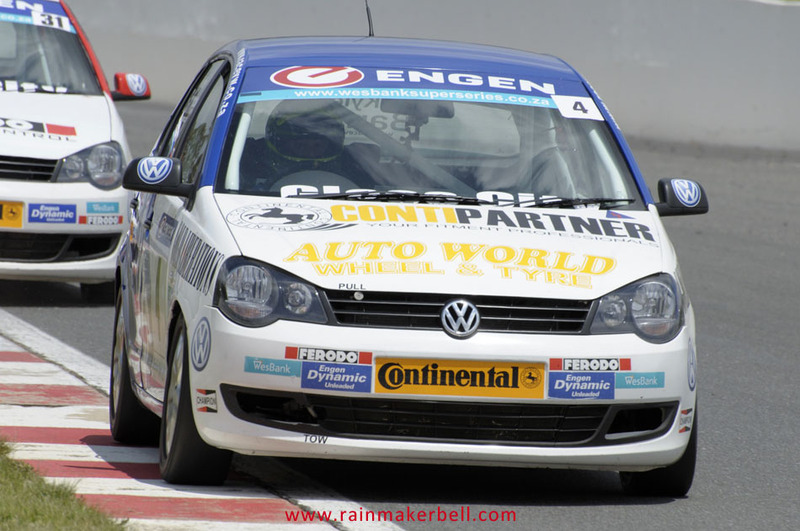 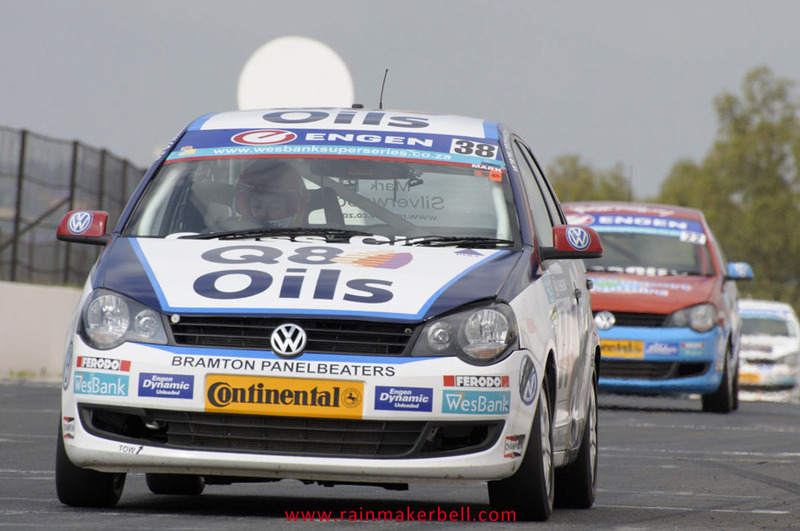 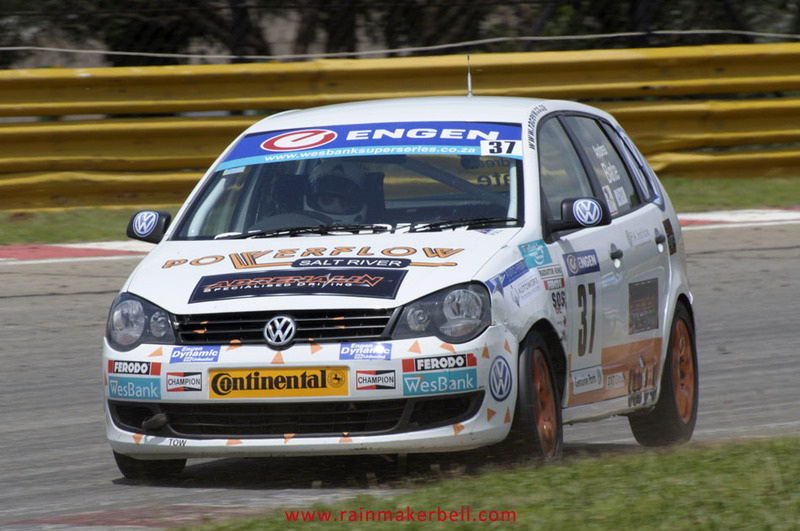 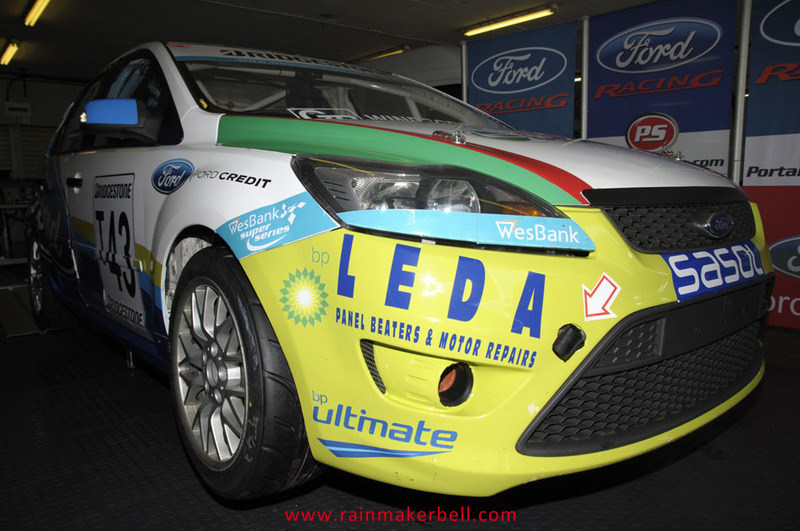 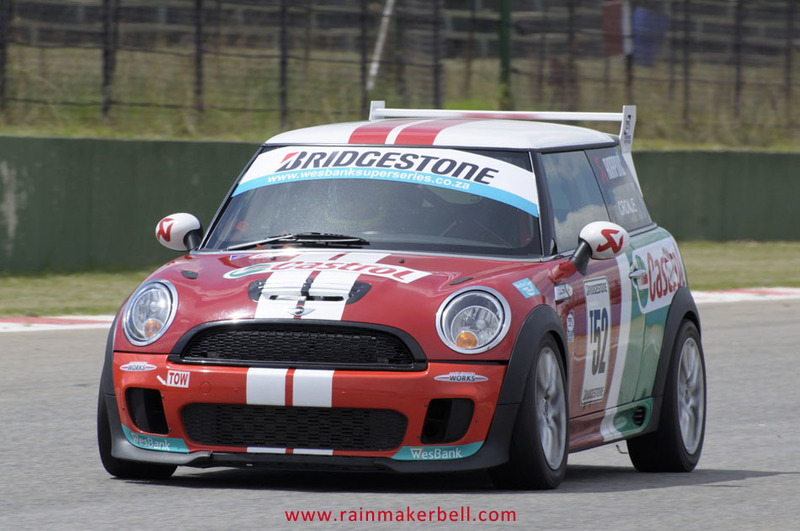 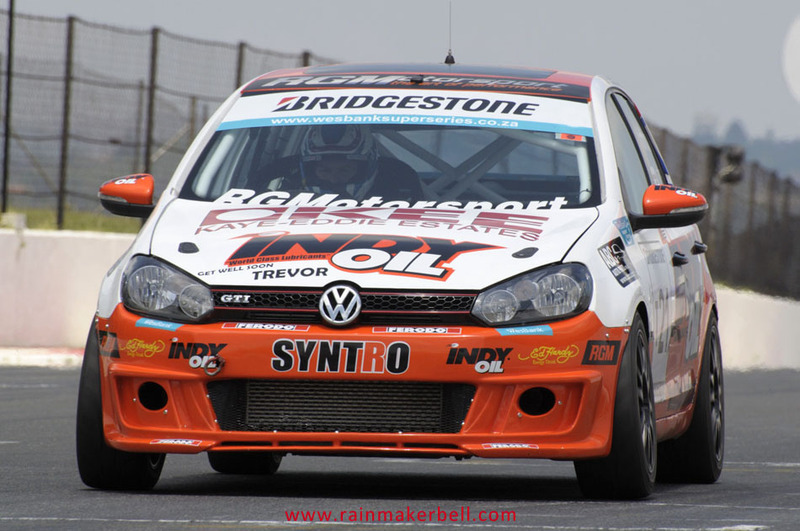 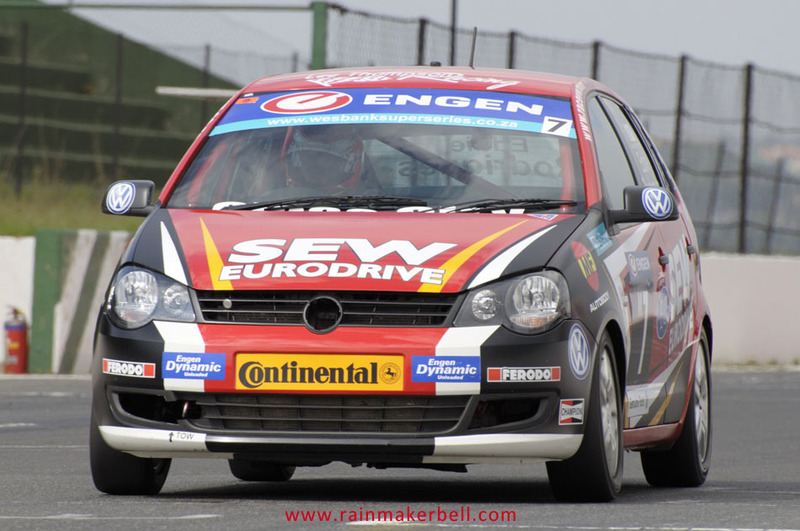 The Engen VW Cup produced two action packed races and although Kelvin van der Linde scored first place in both heats, Dewald Brummer provided action true to his MAD racing-style. 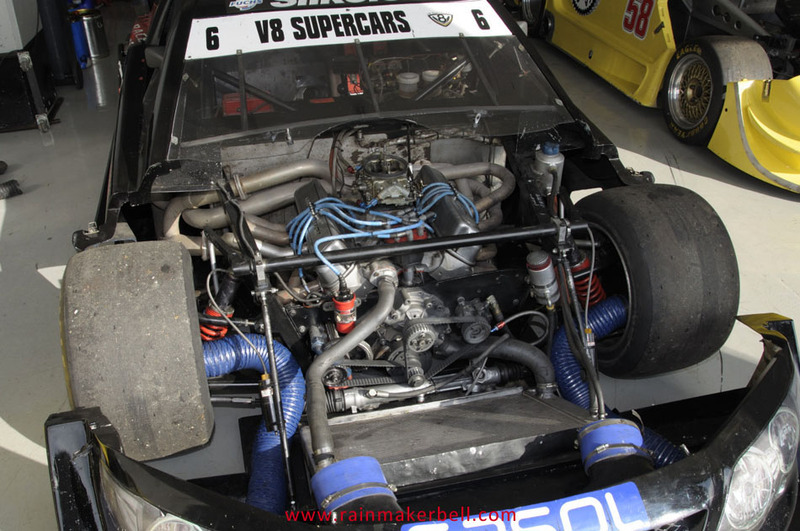 Bridgestone Production Cars and the V8 Supercars incorporating the Shelby Can Ams provided for more race car action. 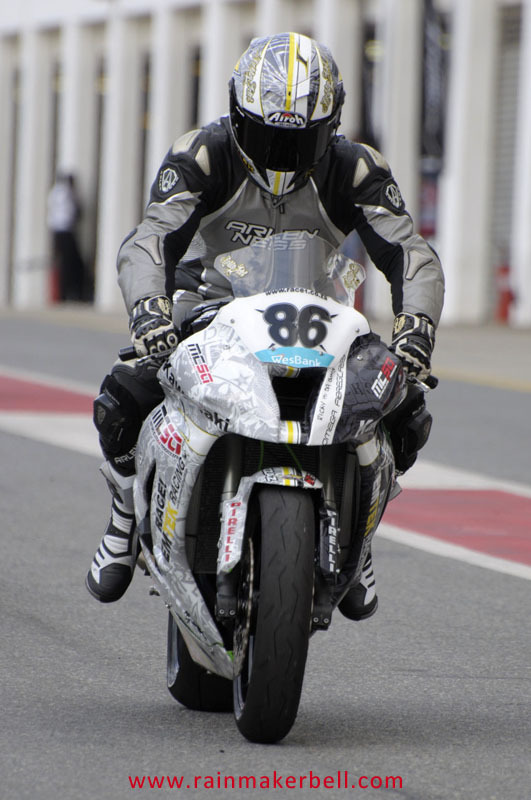 During Friday’s practice session I took my habitual stroll through the motor racing neighbourhood (pit complex)—my way to acclimatize. 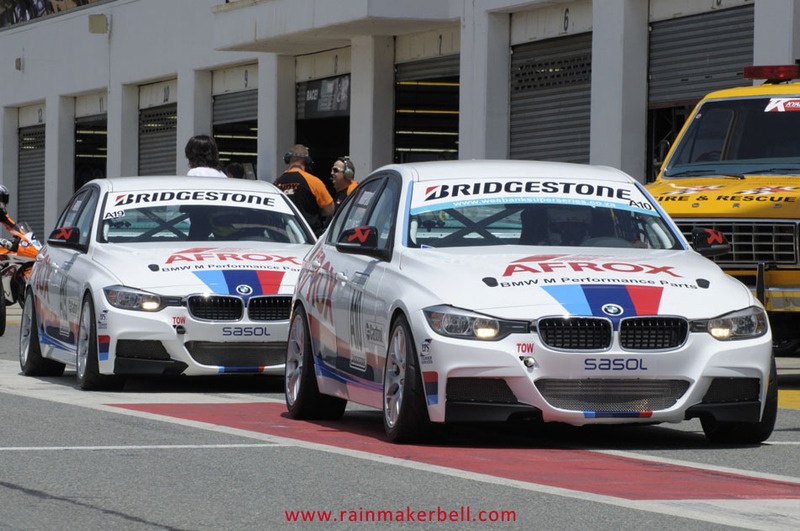 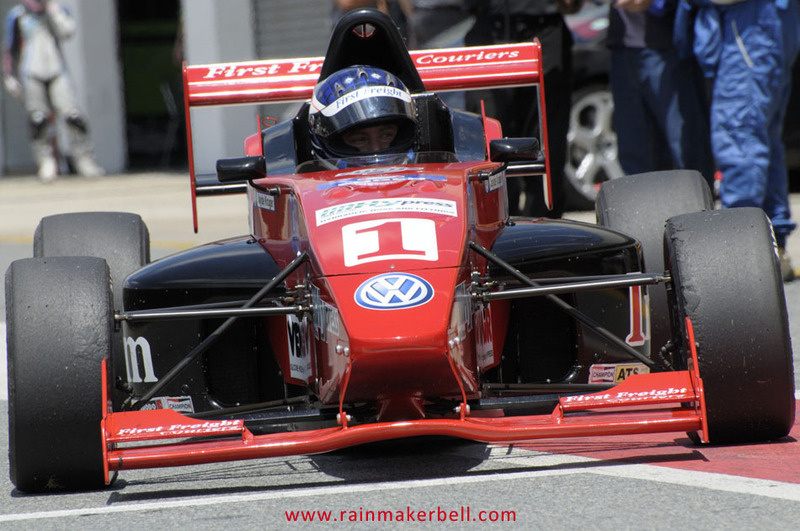 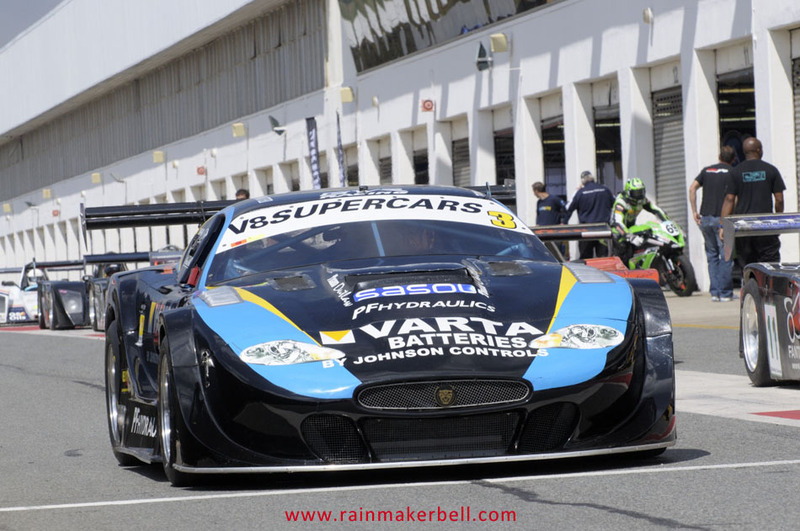 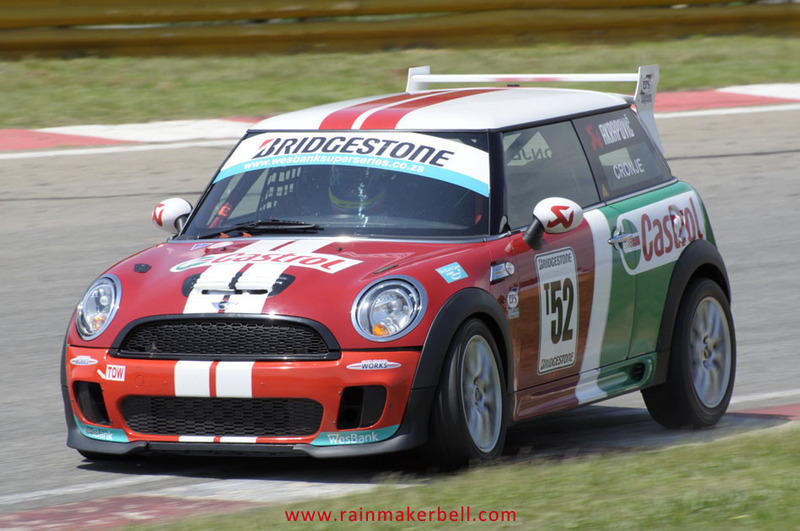 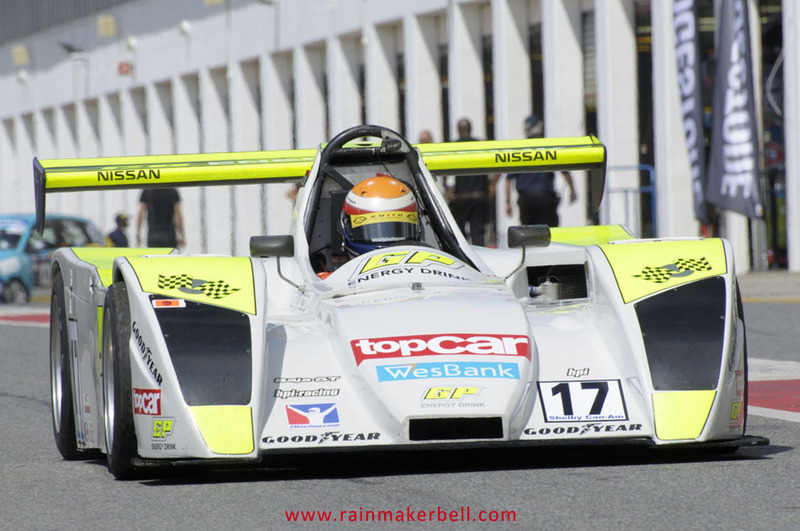 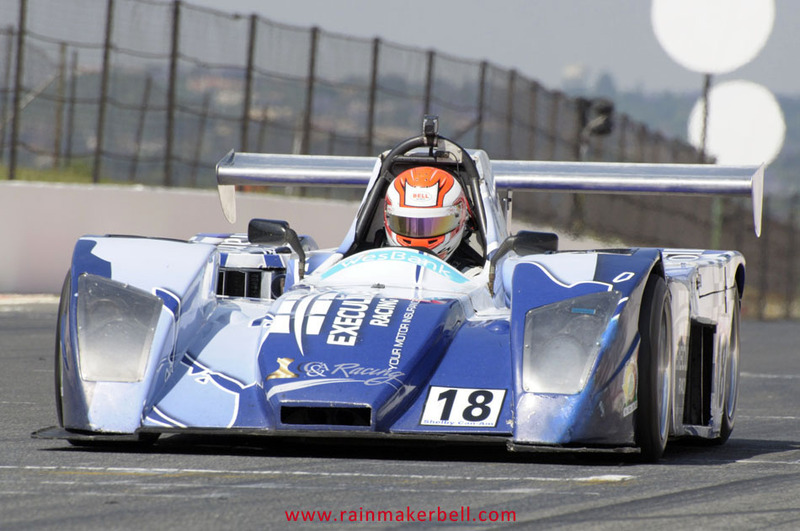 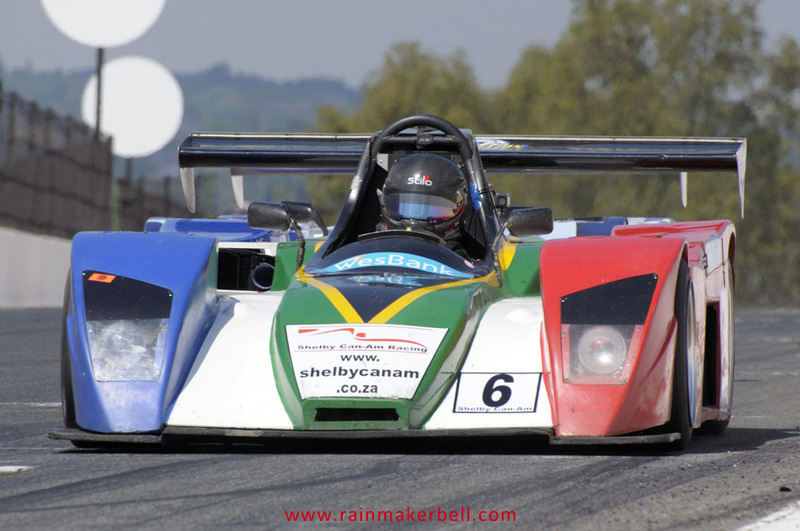 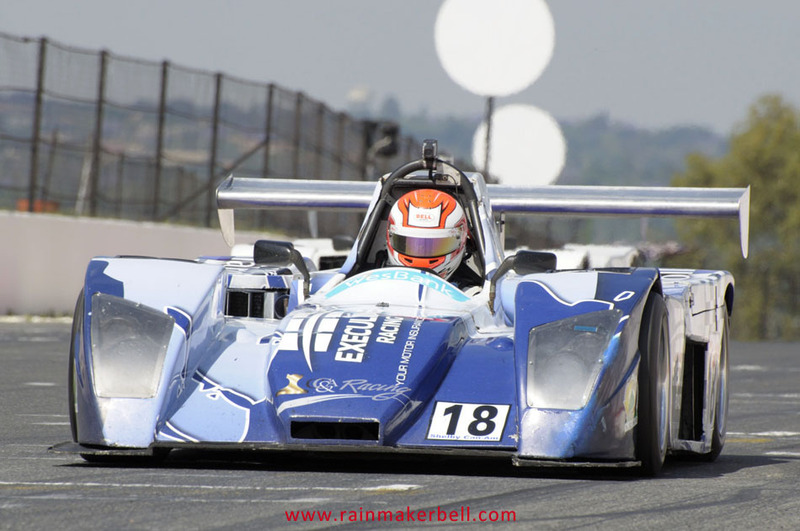 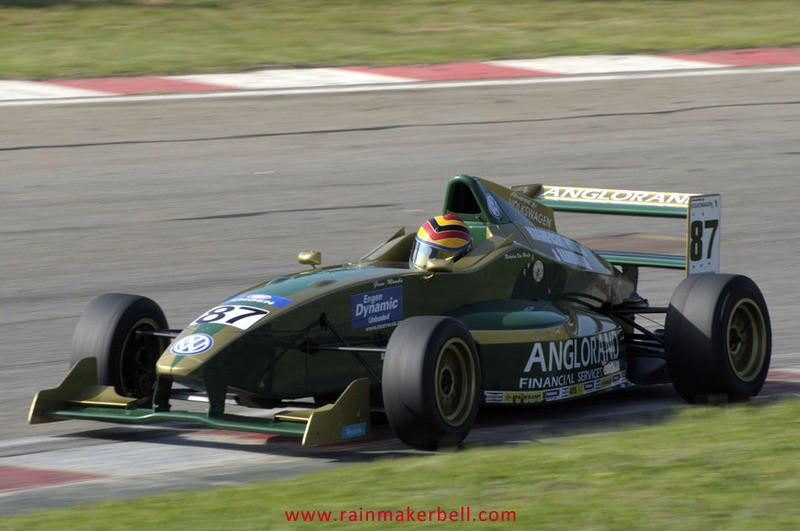 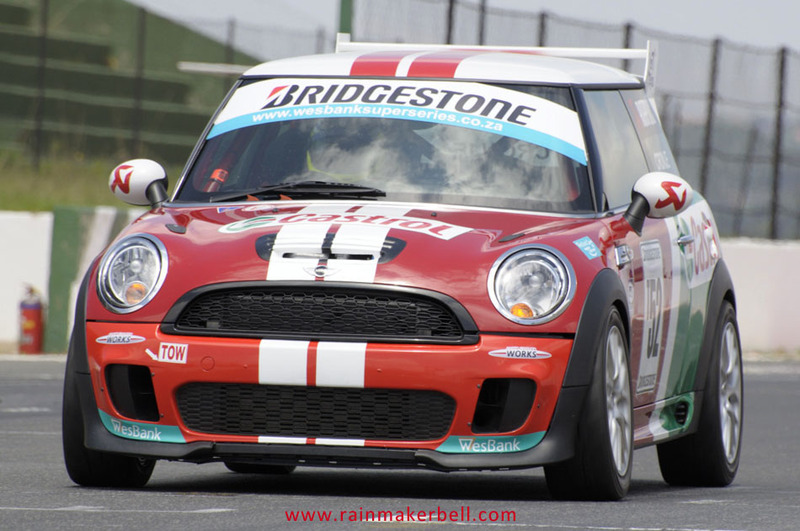 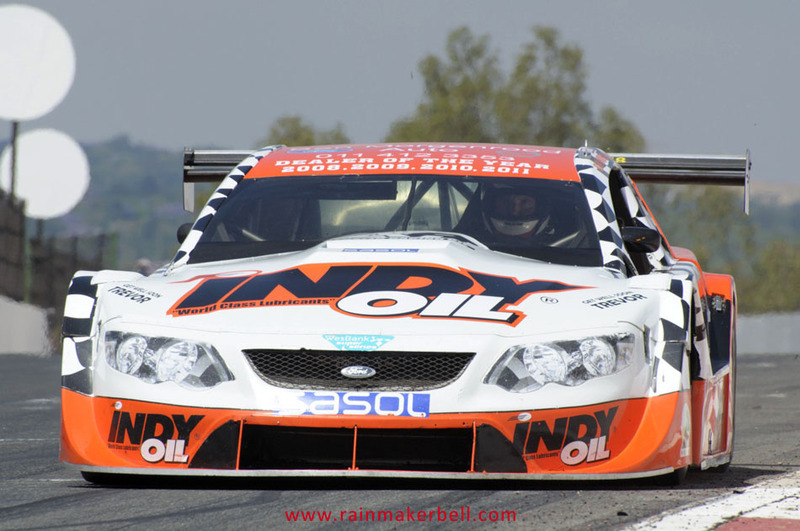 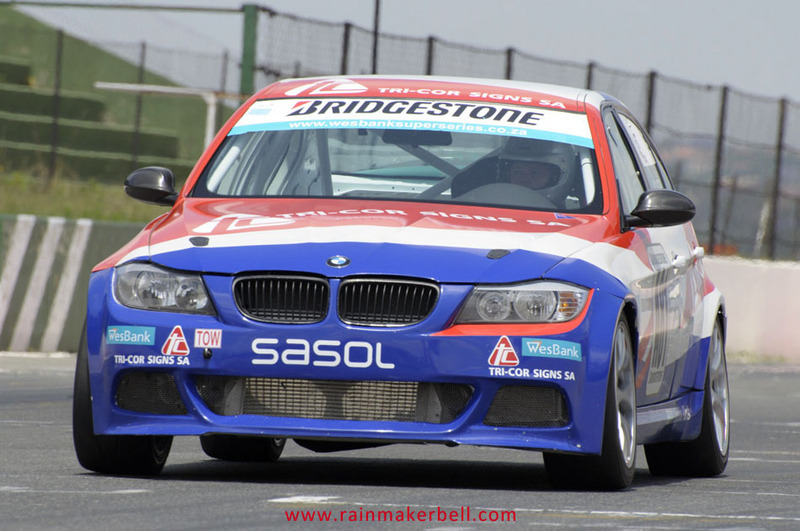 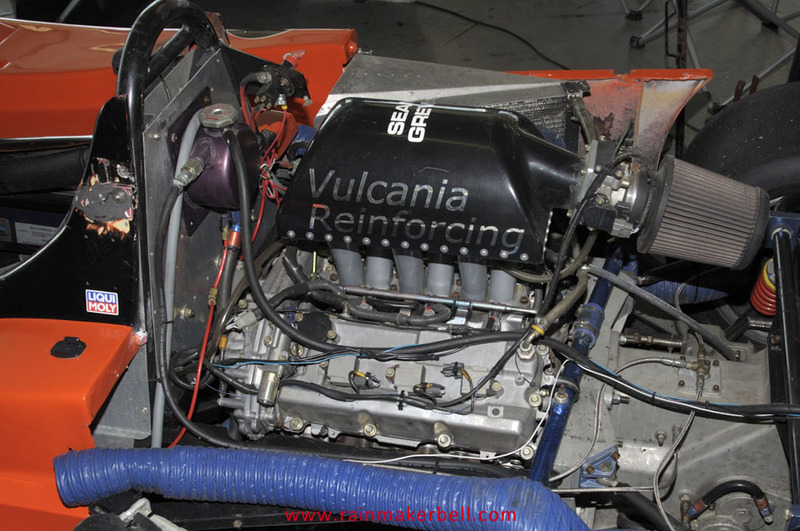 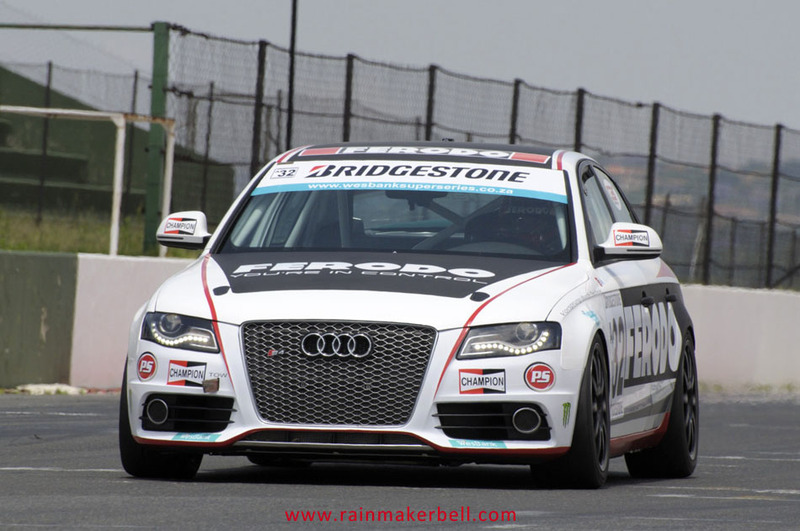 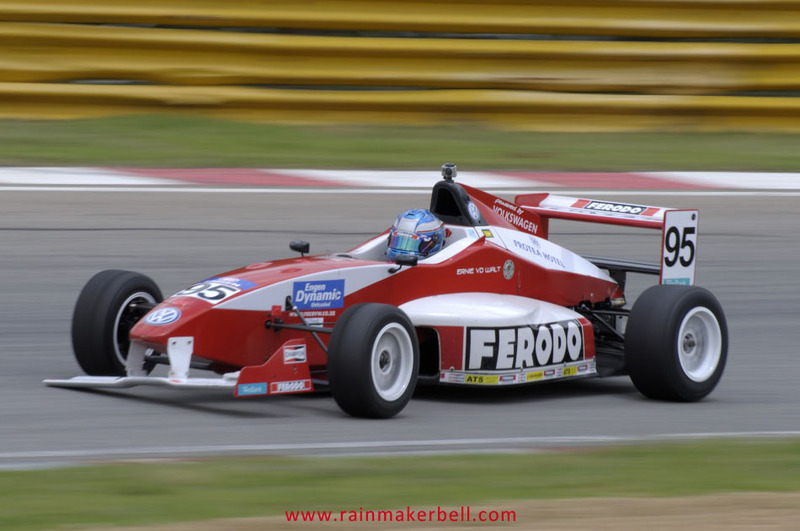 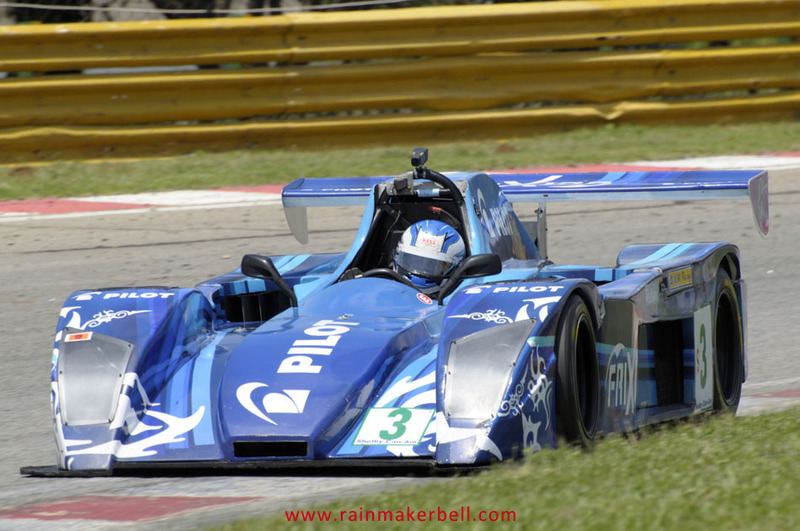 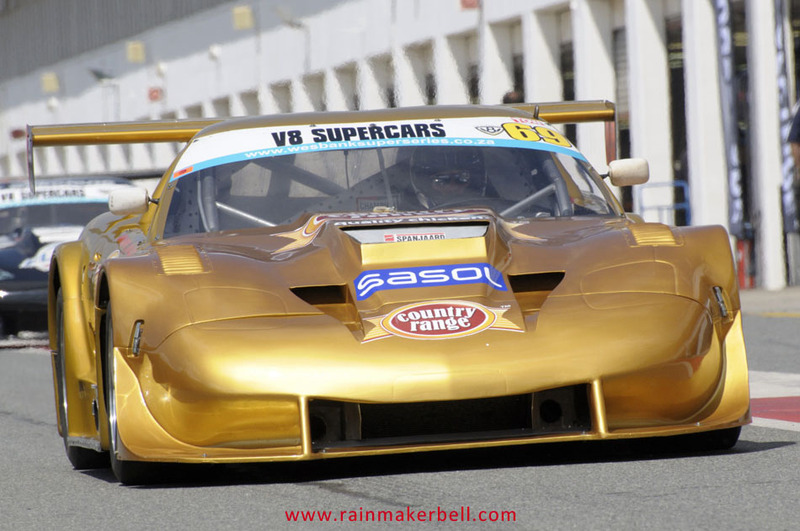 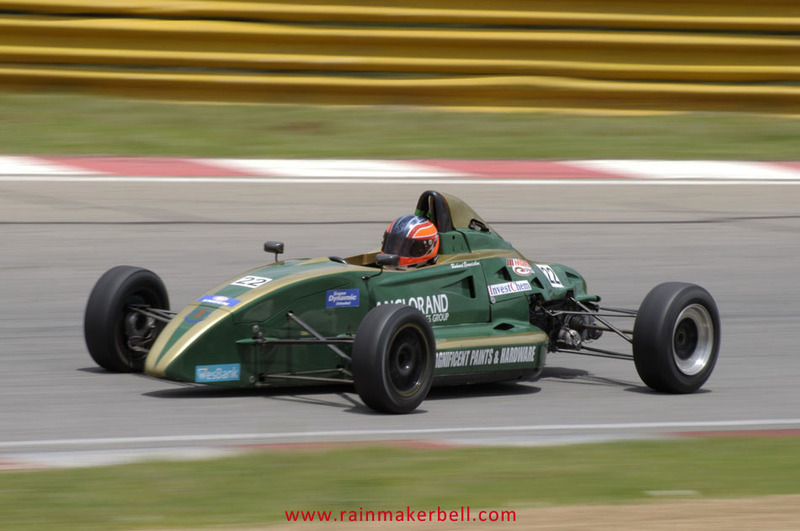 On this stroll you not only get to meet the most interesting people in the local motor racing industry, but it also gives you a chance to see the V8 monsters and other race cars from up close. 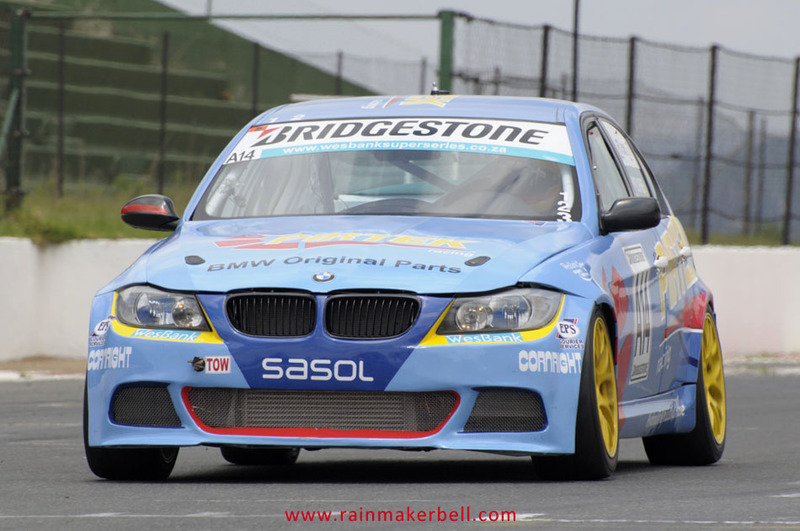 The pit area smelled of race fuel, knackered brakes, worn tyres and exhaust fumes (the perfect mix for men’s aftershave?). 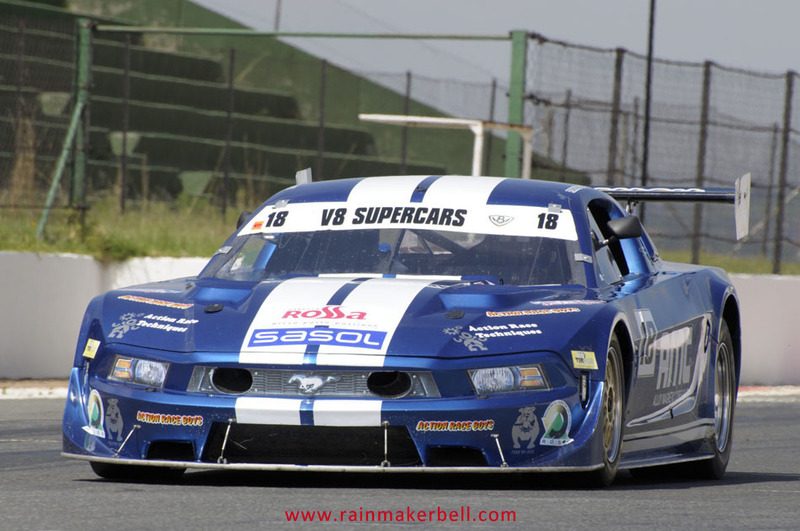 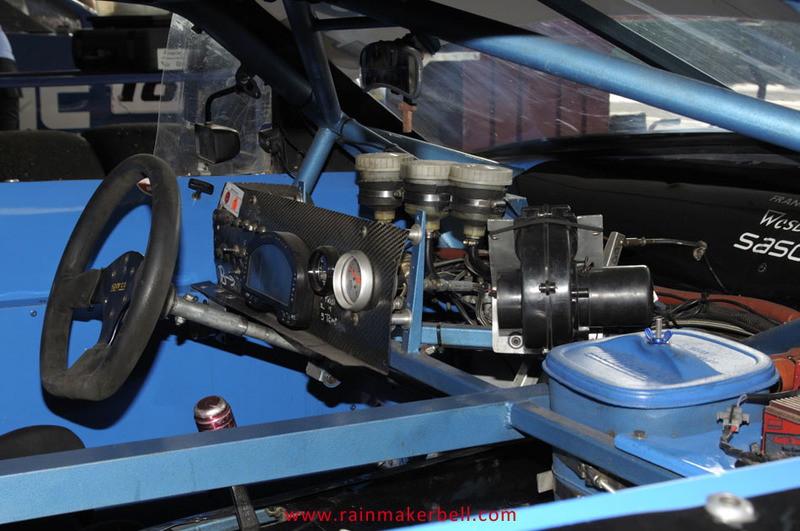 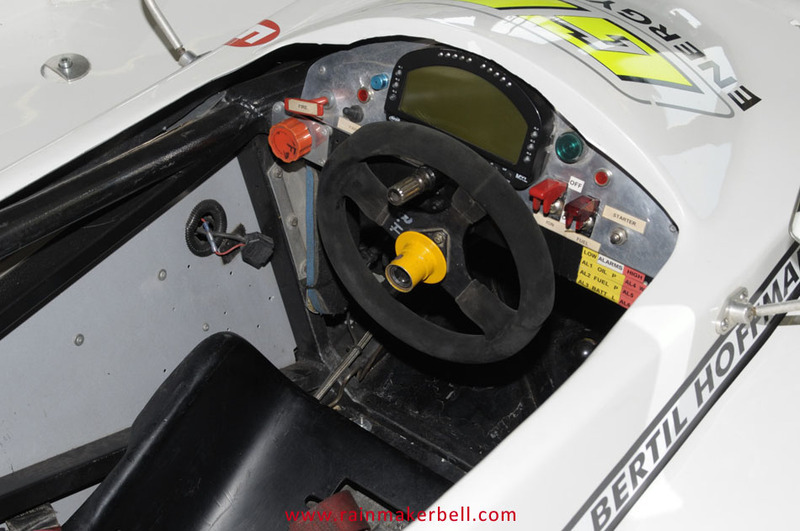 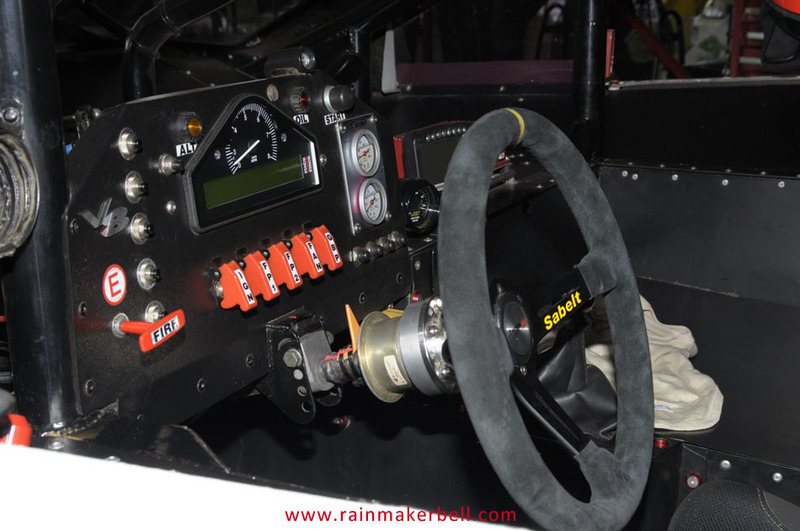 By sticking your head into one of these V8s, you get to appreciate the fine interior and comfortable seating with a perfect view to the outside world, in this case the race track (smile... NOT TRUE). 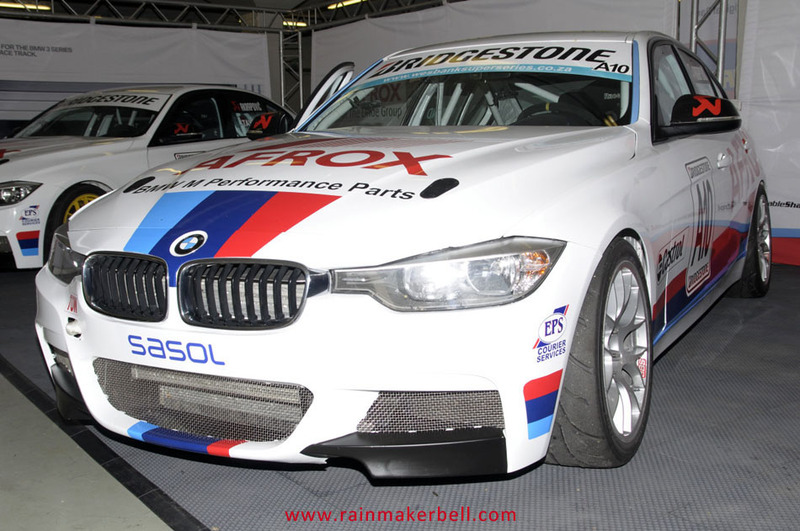 The production cars on the other hand are the exact opposite, they are pimped out with everything great money can buy in terms of race technology. 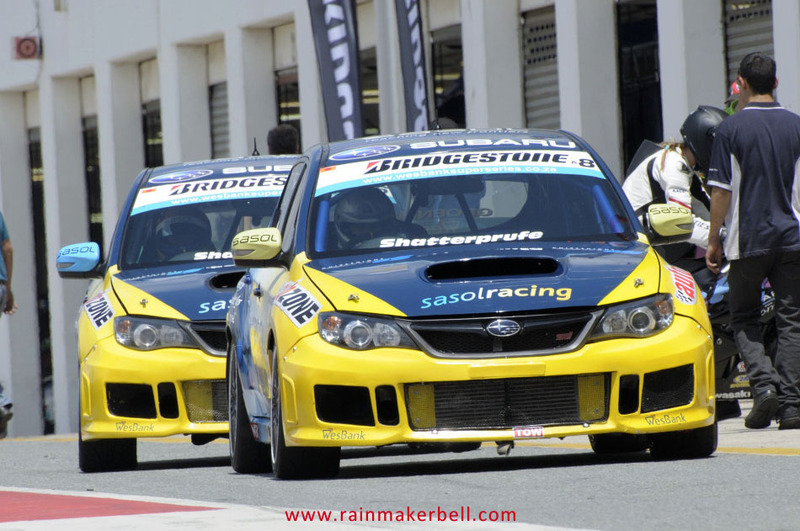 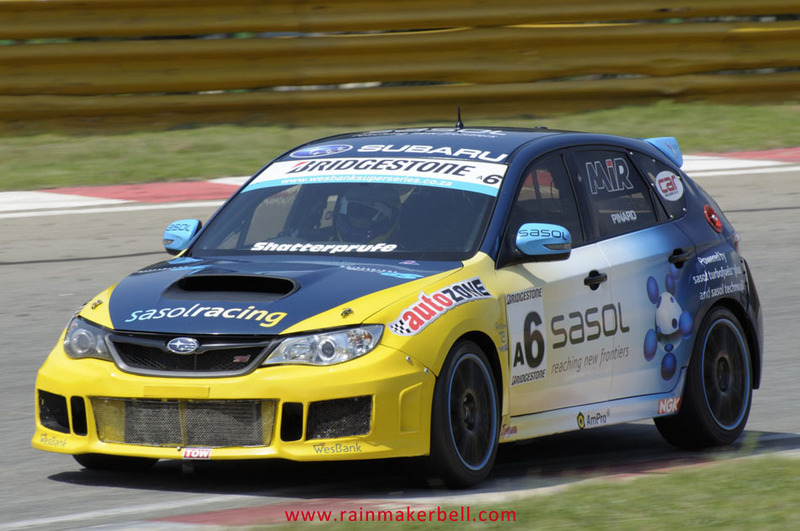 That’s why Hennie Groenewald is always smiling while in his Subaru WRX STI—his production car is more comfortable than his Edblo at home. 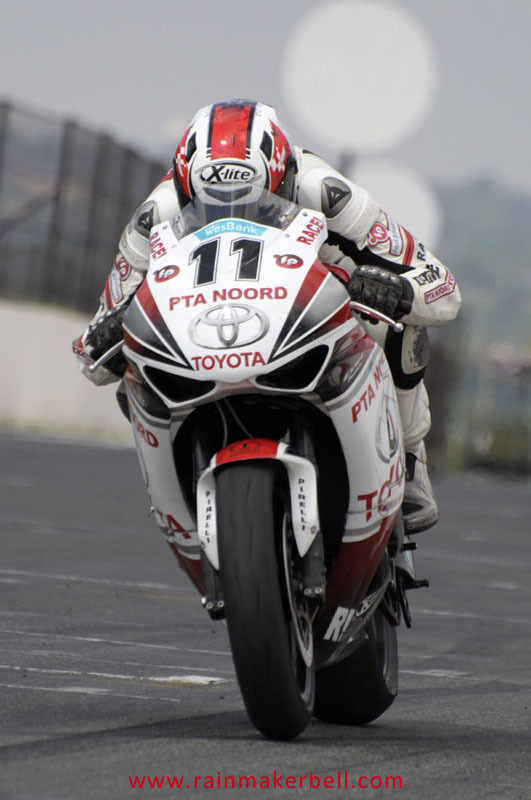 Although he did not take the crown this year, he will definitely have my continuous support in the 2013 season. 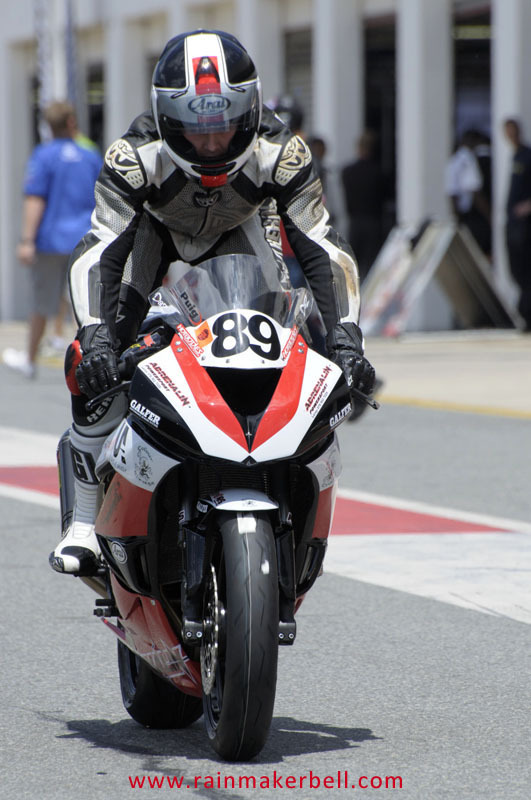 To everybody else that made the 2012 season so great, thank you and hope to see you in the next year. 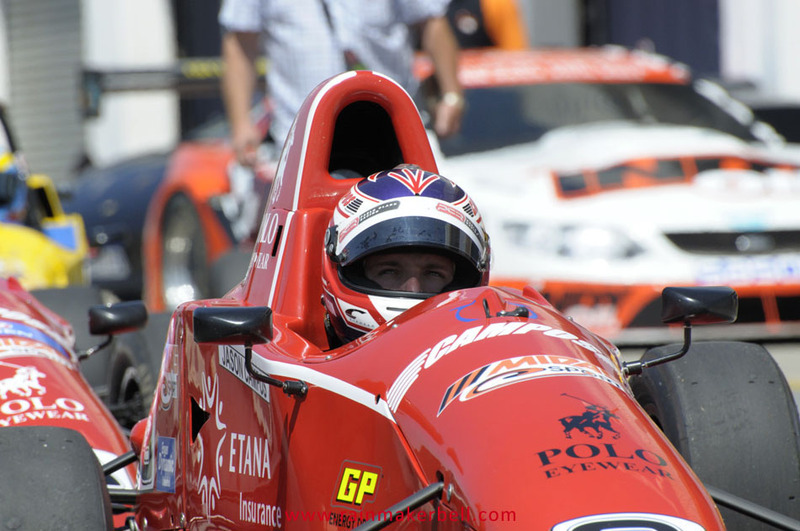 To paraphrase Fleetwood Mac, Don’t stop thinking about tomorrow, yesterday’s gone (but the memories will remain). 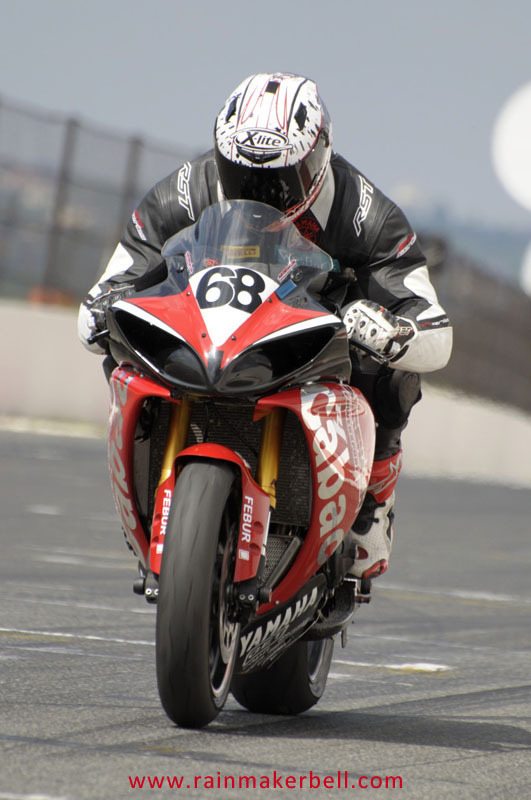 Till next time Godspeed and have a wonderful Christmas. 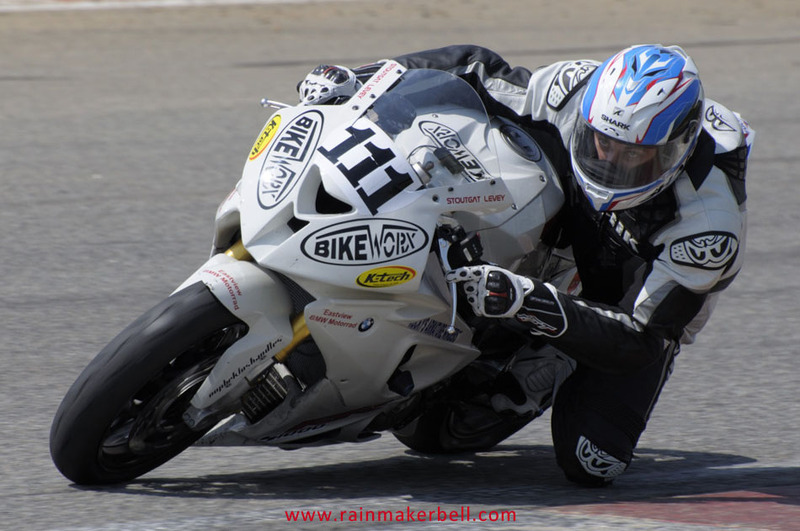 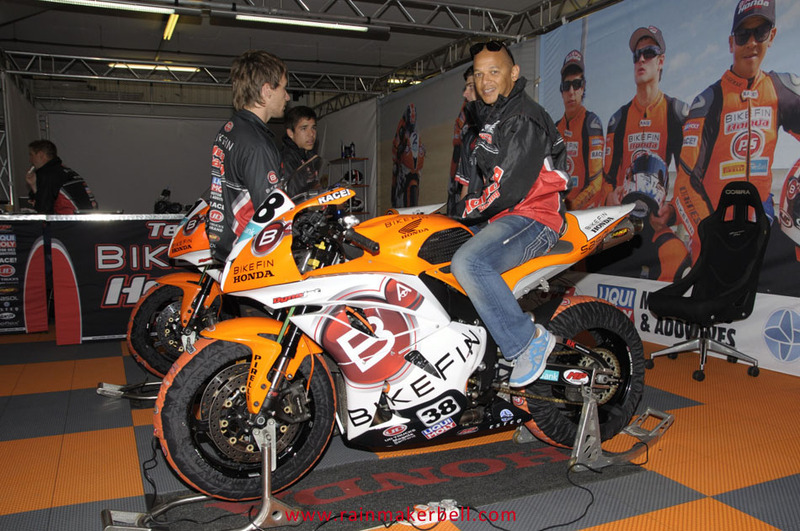 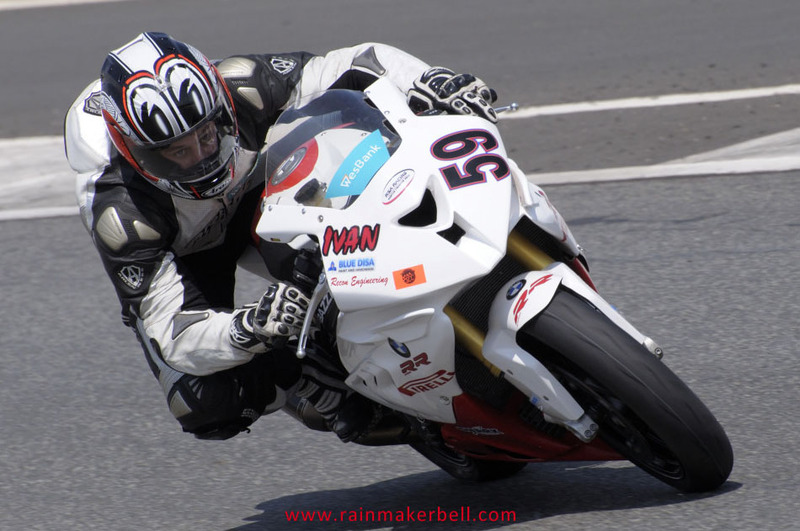 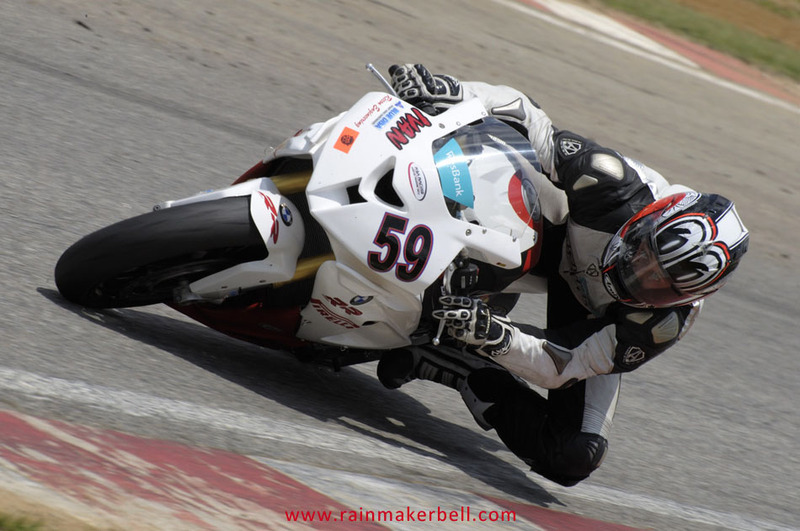 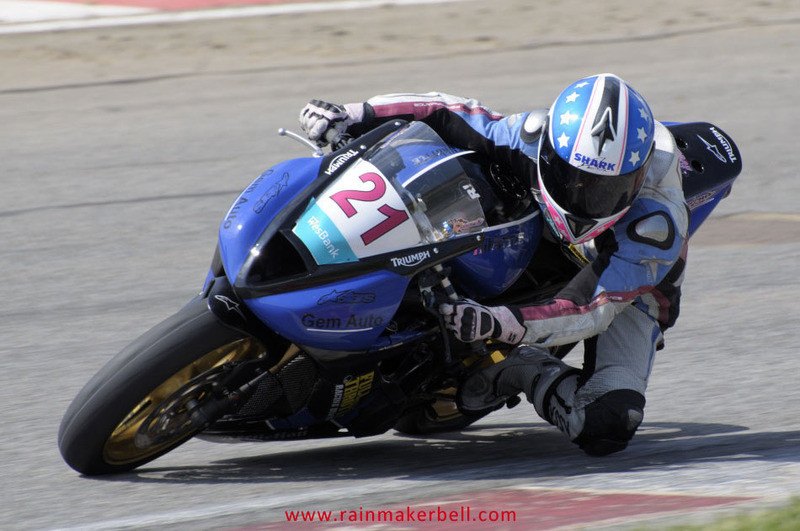 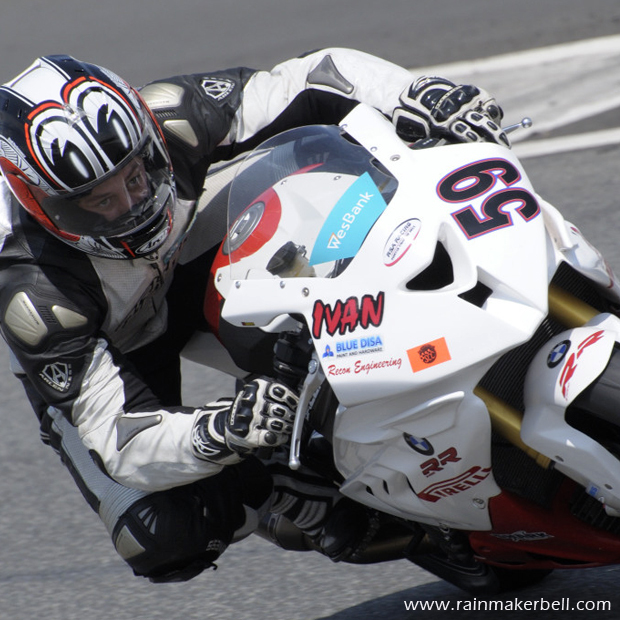 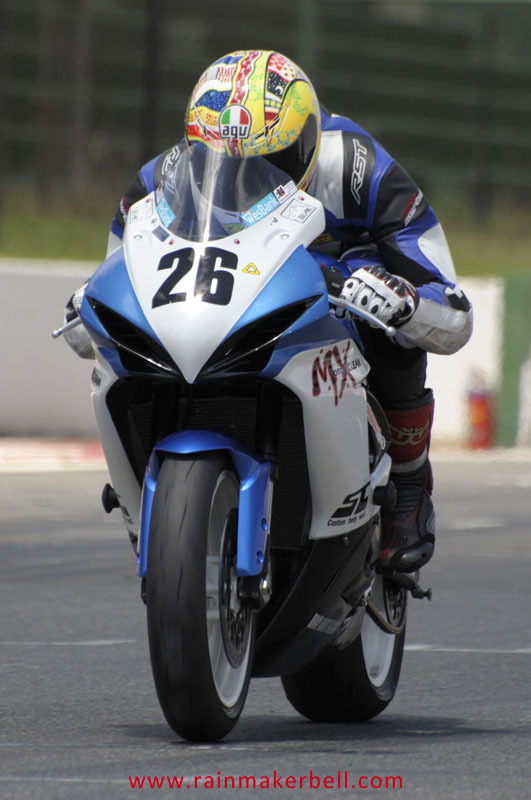 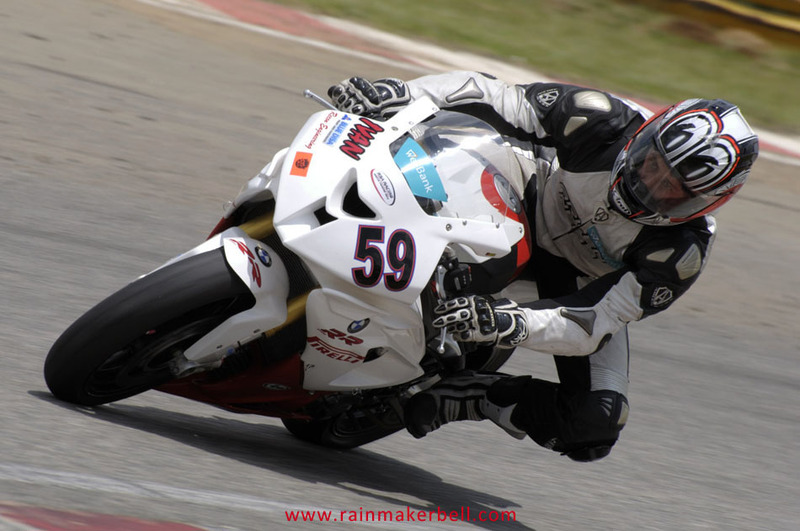 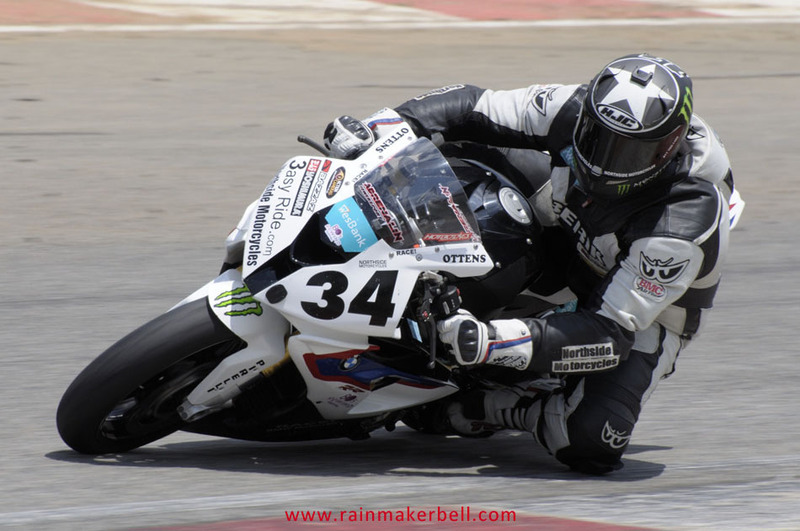 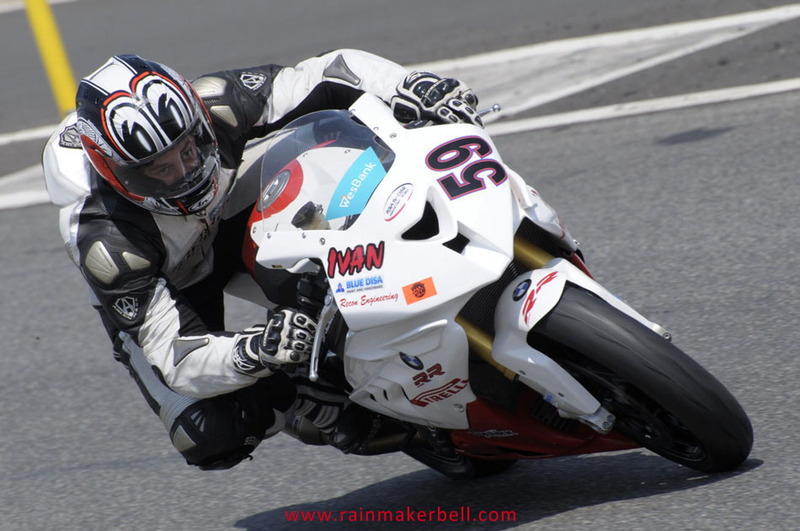 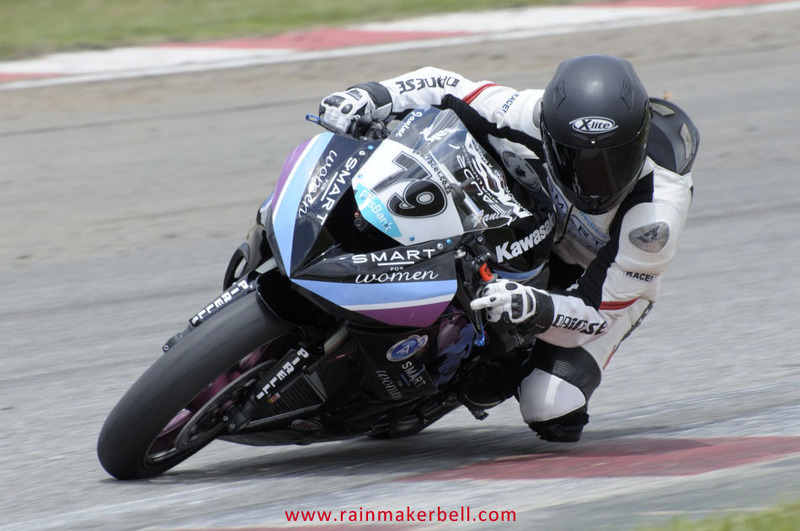 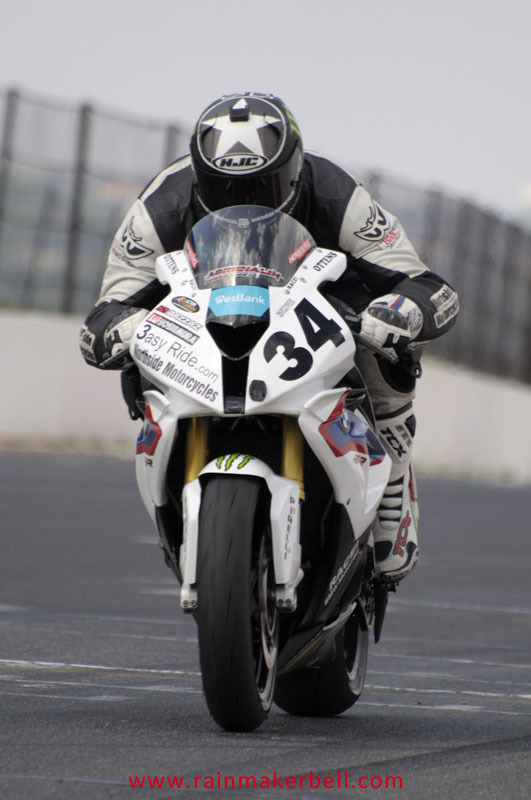 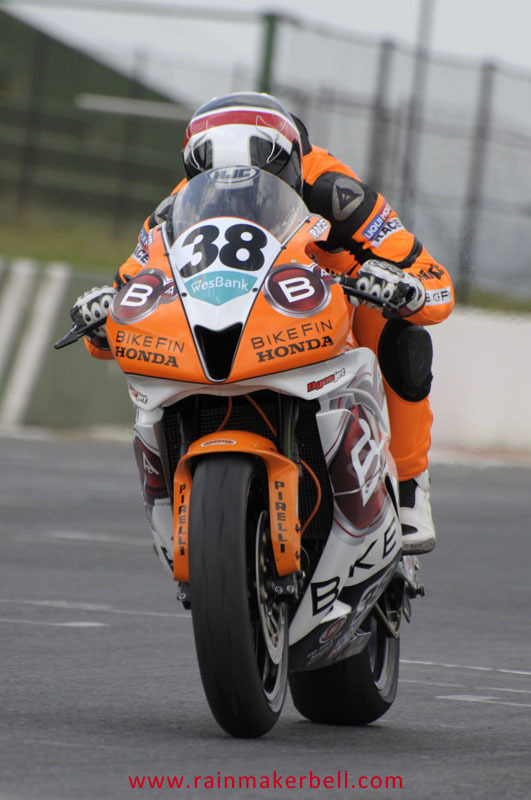 Words & Photos: Adriaan & Martine Venter (Wesbank Super Series, Kyalami Raceway, South African Motorsport, 2012/10/27, 167 images) Main Image: Ivan van Niekerk #59, BMW S1000RR, Superbikes.